(c) the approach will result in the Statement of Proposal being as widely publicised as is reasonably practicable as a basis for consultation. 2. 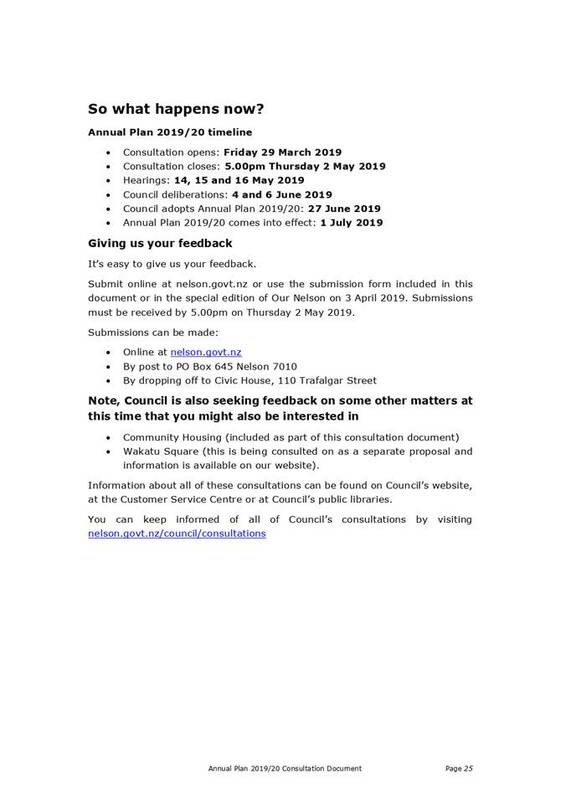 Approves the Nelson Tasman Future Development Strategy consultation document (A2158751), feedback survey (A2158753) and web map (A2158752) for release on 8 April 2019 for public feedback under the Local Government Act 2002. 5. Encourages an approach that supports the strengths and unique character of the Nelson Marlborough Institute of Technology and ensures high quality educational outcomes. 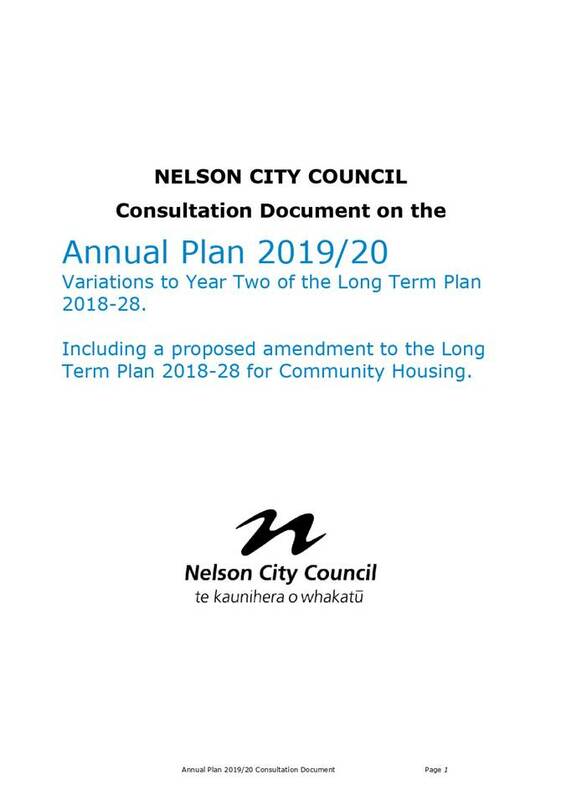 1.1 To adopt the Consultation Document for the Annual Plan 2019/20 including the proposed amendment to the Long Term Plan 2018 – 28 for community housing. 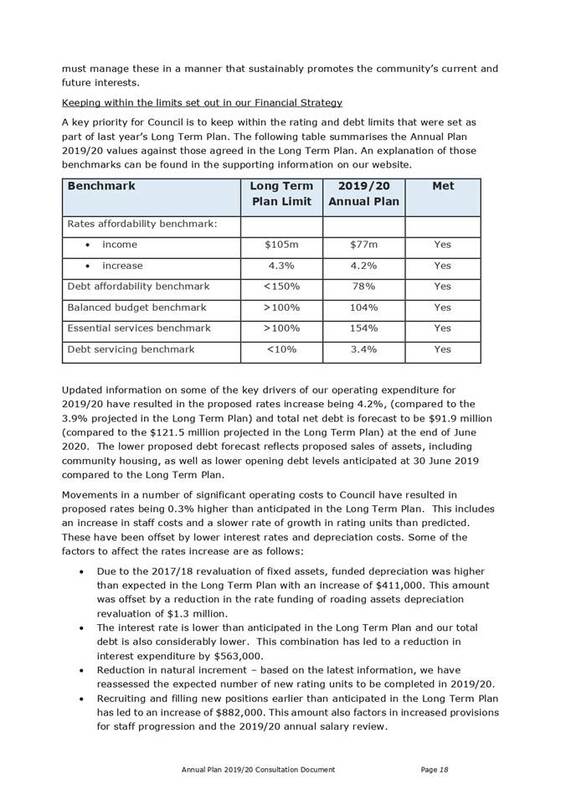 2.1 Council is proposing to amend the Long Term Plan 2018 – 28 (LTP) to allow divesting of its community housing portfolio. 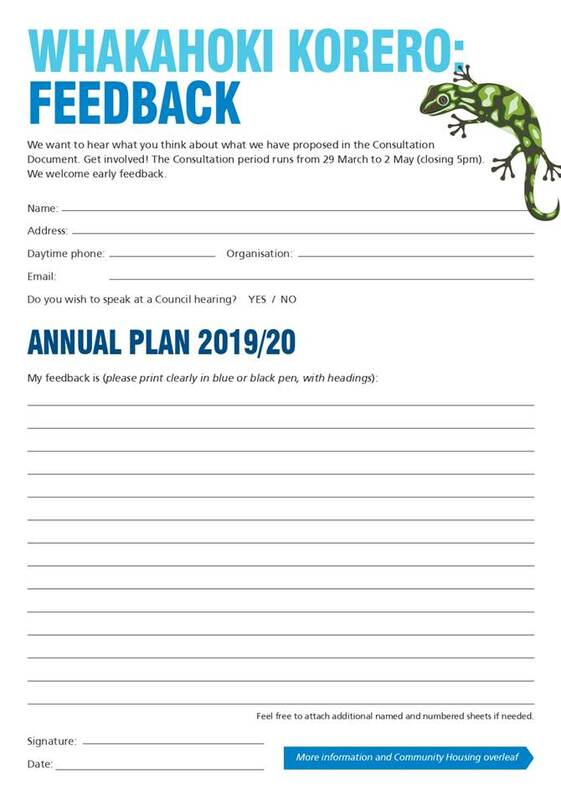 2.2 The community housing proposal is to be included in the Consultation Document for the Annual Plan 2019/20 and the proposed amendment to the Long Term Plan 2018 – 28 (Consultation Document). 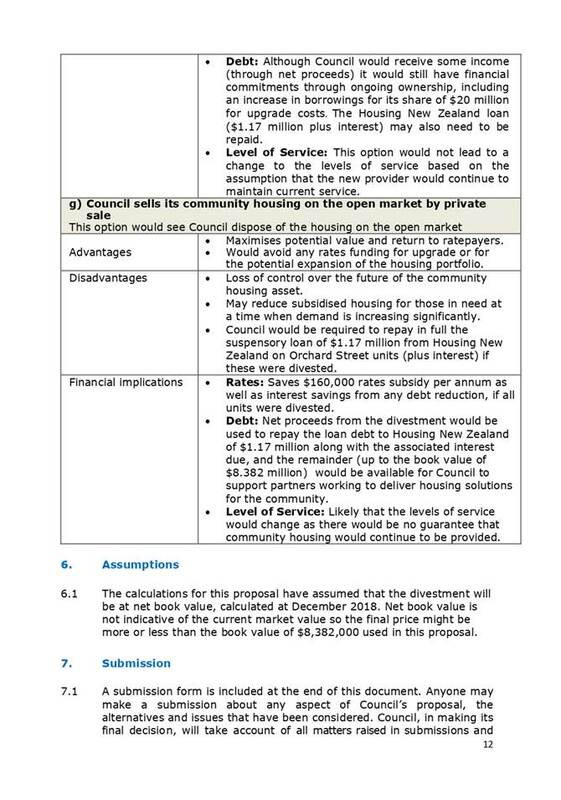 Approves development of a consultation document on the proposal to divest Council’s community housing as part of the draft Annual Plan 2019-20 community consultation. 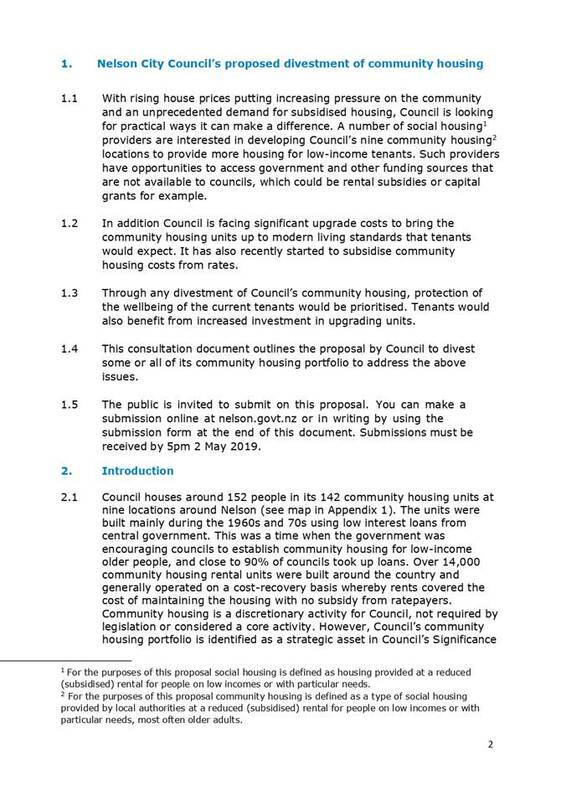 4.3 On 21 March 2019, the draft Consultation Document for the Annual Plan 2019/20 was before Council with a recommendation that the document be adopted in principle, subject to the outcome of today’s meeting regarding the proposal on community housing. 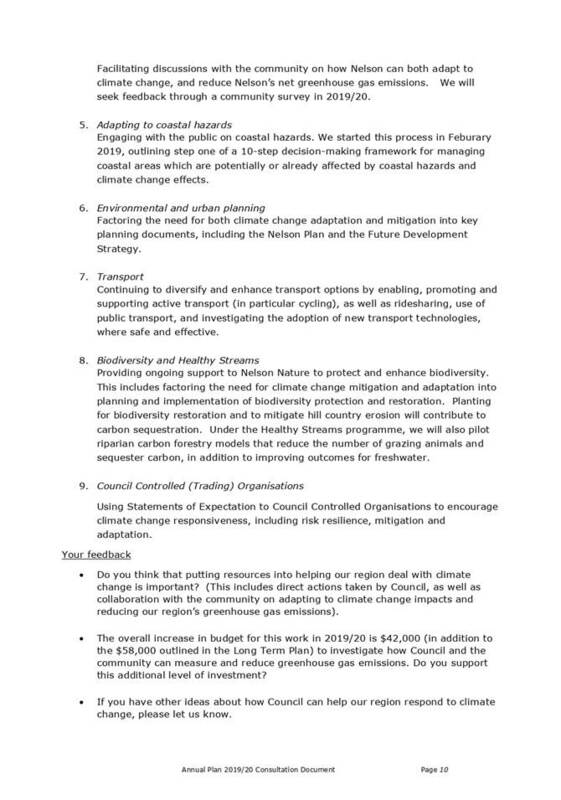 The proposed consultation process was also included in the report to the 21 March Council meeting. (If required, officers can provide a verbal update on the outcome of that meeting). 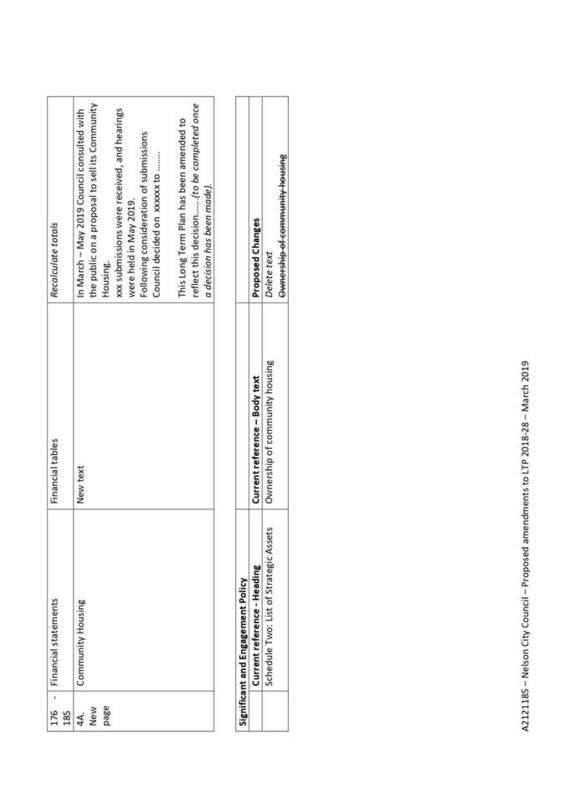 4.4 The community housing proposal has now been included in the Consultation Document (Attachment 1 A2160794). The next step is for Council to adopt the full Consultation Document. 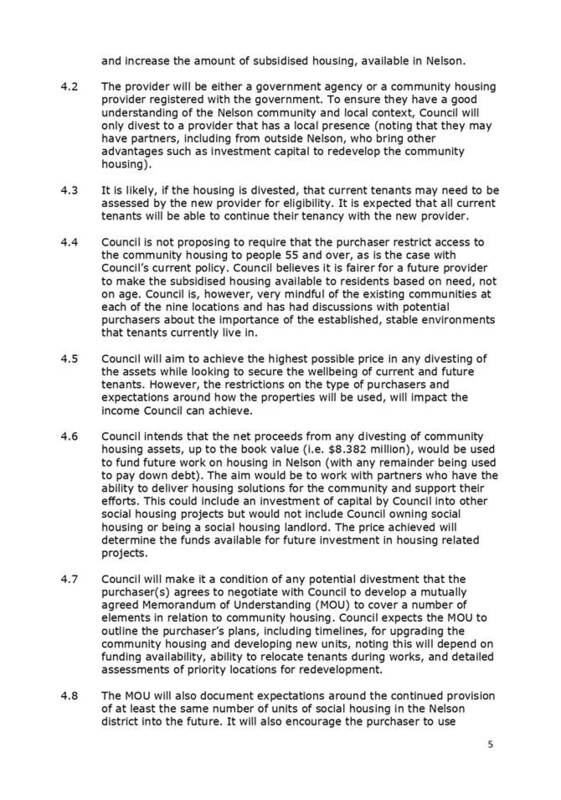 5.1 The Consultation Document includes the proposal to divest some or all of Council’s 142 community housing units. 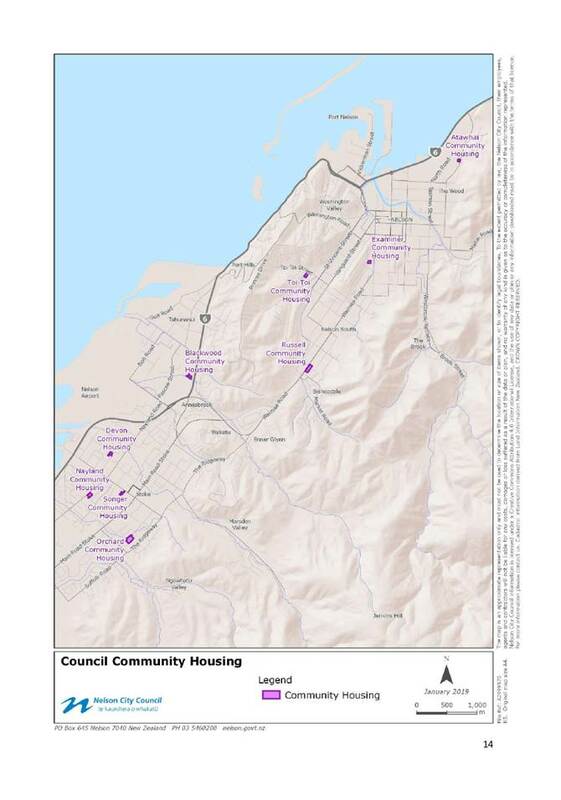 The aim is to leverage off Council’s community housing asset to achieve an increase in social housing in Nelson, recognising the growing need. 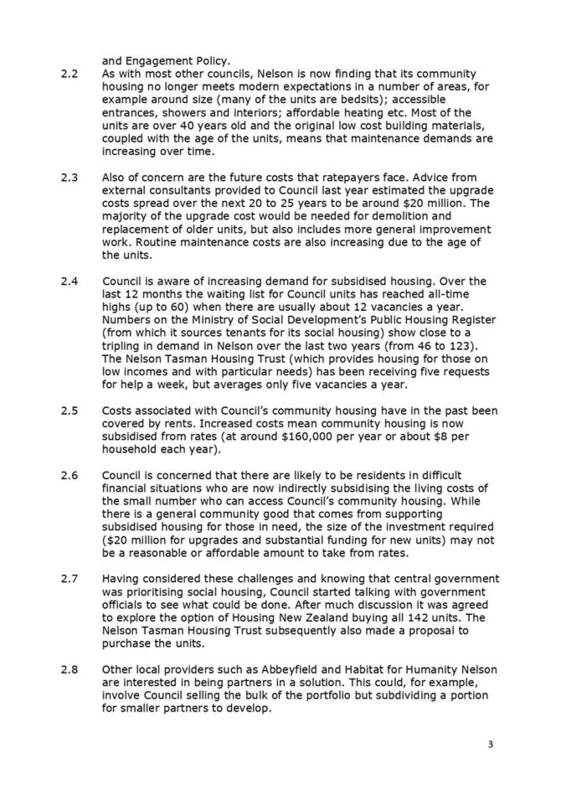 The proposal is to divest the housing to a provider or providers that specialise in delivering subsidised housing to people in need and who has the opportunity to access government and other funding that Council is not eligible for. This will also help to address the equity and affordability issues that the current situation with Council’s community housing presents. 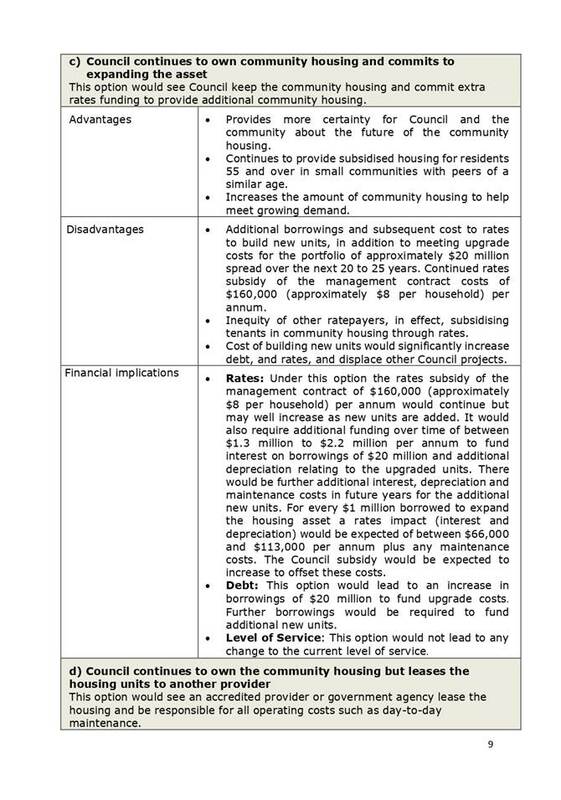 5.2 The other options that Council has considered in relation to community housing and their respective advantages and disadvantages are also set out in the Consultation Document. 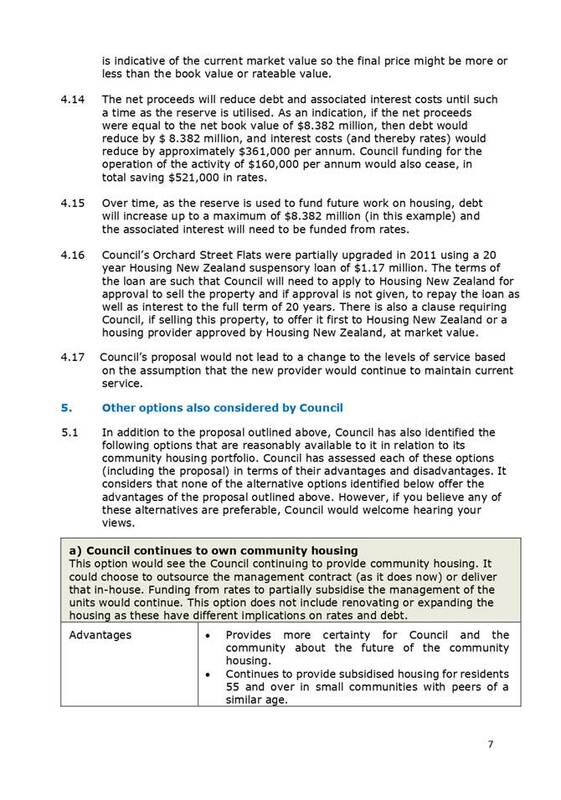 5.3 As community housing is a strategic asset in Council's Significance and Engagement Policy, the proposal to divest triggers an LTP amendment process, including an audit by Audit New Zealand, and the requirement to use a special consultative procedure. 5.4 The proposed LTP amendment is being undertaken at the same time as the annual plan consultation process, and therefore the Consultation Document must include the content required for both consultation processes. 5.5 Council approved the draft community housing consultation information for Audit on 19 February 2019 and noted that subsequent amendments would be made. 5.6 Following Council’s approval on 19 February 2019, officers have been corresponding with Audit New Zealand to finalise the proposal in order for them to issue their Audit Opinion. 5.7 Audit New Zealand’s opinion on the LTP amendment will be tabled at the meeting and will be included in the Consultation Document before it is published. 5.8 Previous reports have outlined the Public Works 1981 requirements in relations to the properties and no barriers were found that would constrain sale of the portfolio. Likewise no barriers to sale were found in terms of the LGA. One outstanding matter remained from previous reports, which related to LGA Section 141. 5.9 Section 141(1)(a) of the LGA states that the Council cannot sell or exchange trust or endowment land unless the proposed use of proceeds is consistent with the purpose of the endowment and Council has, in accordance with section 141(1)(d), made reasonable efforts to notify the donor of the property (including successors) of the proposal and provided the donor with a reasonable opportunity to comment. 5.10 Section 141 applies to two properties, Examiner Street and St Francis Way. The property at Examiner Street was transferred to Council in 1973 on the basis that Council would build new units for the aged or needy. St Francis Way was acquired from the Roman Catholic Archdiocese in 1997 for pensioner housing. 5.11 To meet the requirement set out in section 141(1)(a), the use of proceeds from any sale of these properties would need to be consistent with the purpose of the endowment. Officers consider the proposed use for social housing generally is sufficiently consistent with both the earlier endowments to meet this requirement. 5.12 The requirement set out in section 141(1)(d) has been met. In relation to Examiner Street, the Public Trust, which held the property under the will of the original donor from 1882 until it was transferred to Council, has confirmed that it holds no records of any successors for the property. 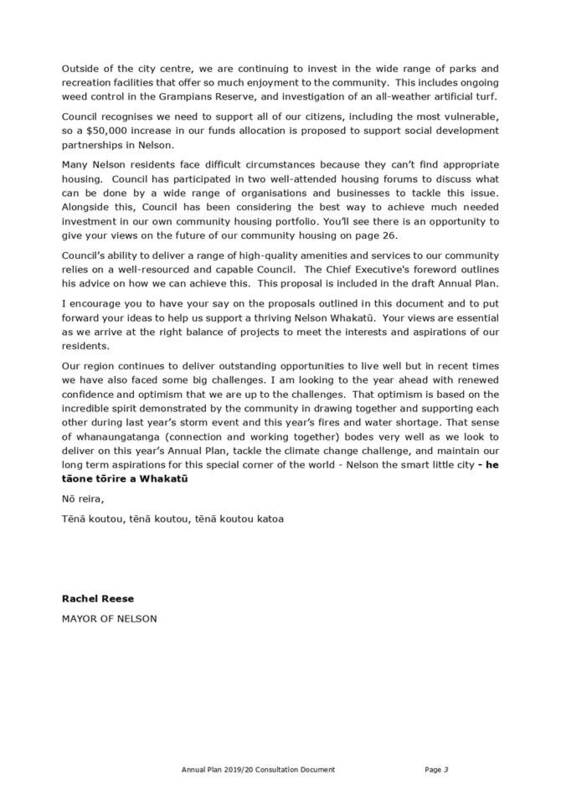 In relation to St Francis Way, the Roman Catholic Archdiocese of Wellington has confirmed it has no concerns with Council’s proposal to divest. · Redacted Council report 13 December 2018. This report was included in the public excluded section of the 13 December 2018 meeting. Information has been redacted for the following reasons: Making it available is likely unreasonably to prejudice the commercial position of the person who supplied it or who is the subject of the information; to maintain legal professional privilege; to enable Council to carry on negotiations without prejudice or disadvantage. (Sections 7(2)(b)(ii), 7(2)(g) and 7(2)(i) of the Local Government Information and Meetings Act 1987). 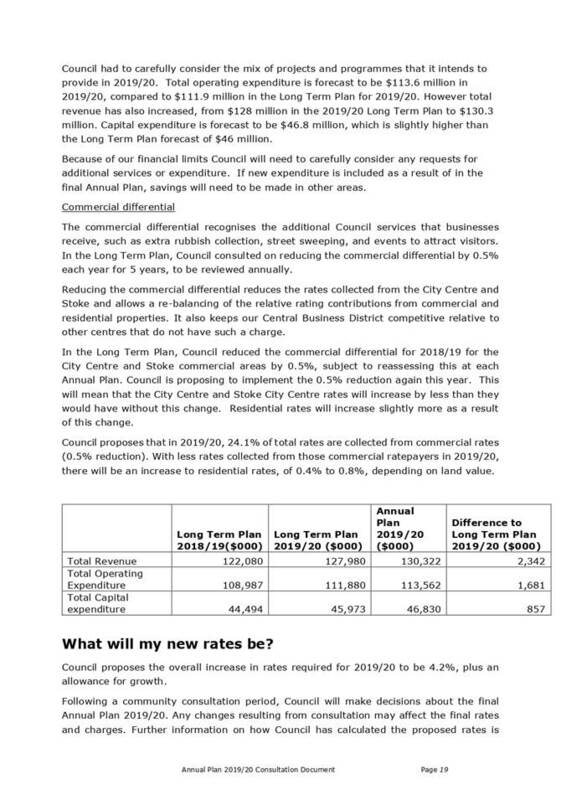 · Redacted Council report 19 February 2019. This report was included in the public excluded section of the 19 February 2019 meeting. 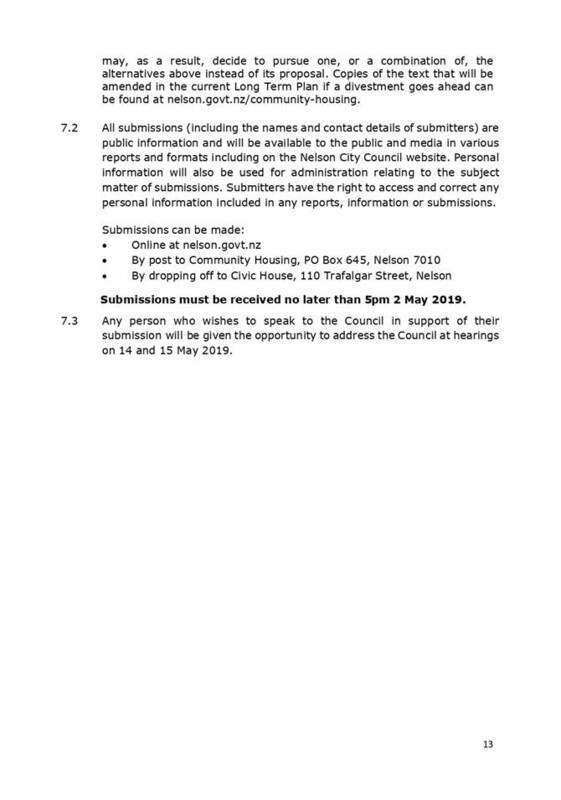 Information has been redacted for the reasons outlined above and to maintain the effective conduct of public affairs through the free and frank expression of opinions by Council officers. (Sections 7(2)(b)(ii), 7(2)(f), 7(2)(g), 7(2)(i) of the Local Government Information and Meetings Act 1987). 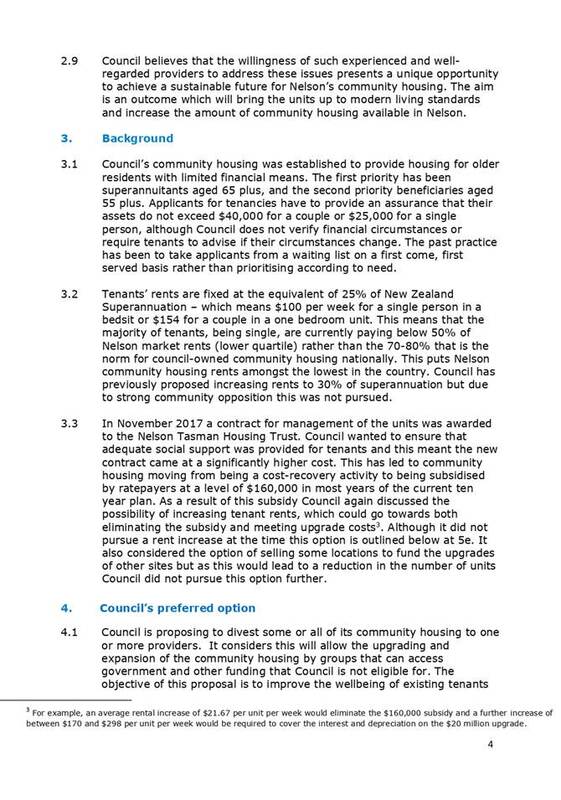 · Redacted Stimpson and Co report “Nelson City Council Community Housing Options” November 2017. Information has been redacted as making it available is likely unreasonably to prejudice the commercial position of the person who supplied it or who is the subject of the information. (Section 7(2)(b)(ii) of the Local Government Information and Meetings Act 1987). 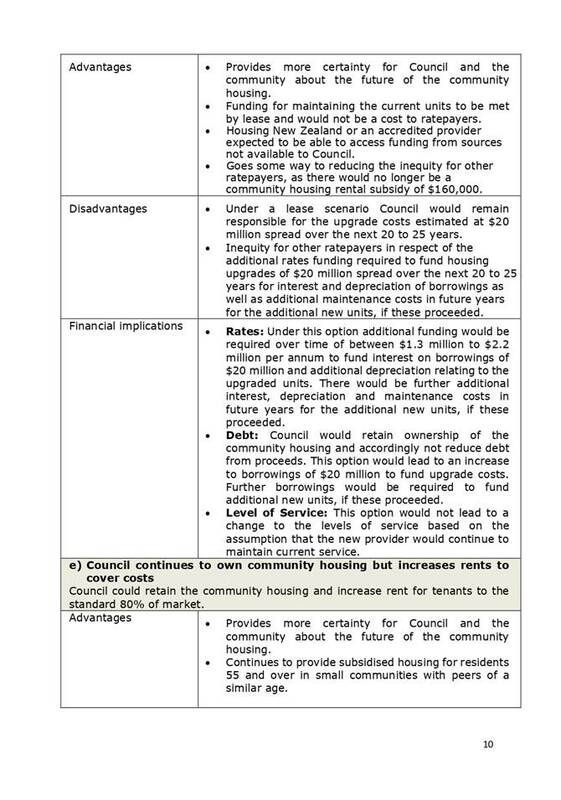 · Change log showing the proposed LTP amendments relating to community housing (Attachment 2). · Social media and media releases about the Annual Plan and community housing consultation will also be used to publicise the consultation. 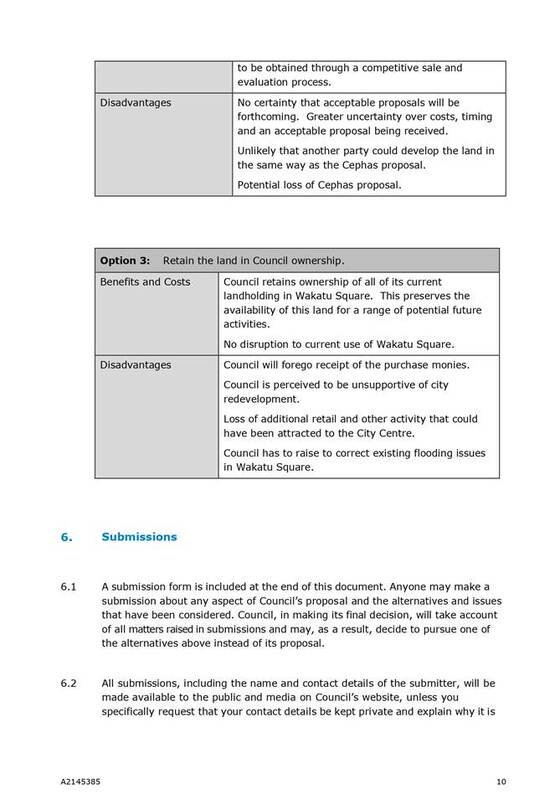 6.1 Council can either adopt or amend the Consultation Document. Substantive changes, particularly financial changes, will require amendments to the timetable for consultation and decision making. In this case Council may not meet the statutory deadlines for adoption of the final Annual Plan. · If Council considers that the Consultation Document does not meet its needs or the needs of the community, Council can direct officers to make further changes before releasing it for consultation. · Financial changes would have an impact on the rates rise and financial information included in the supporting information. 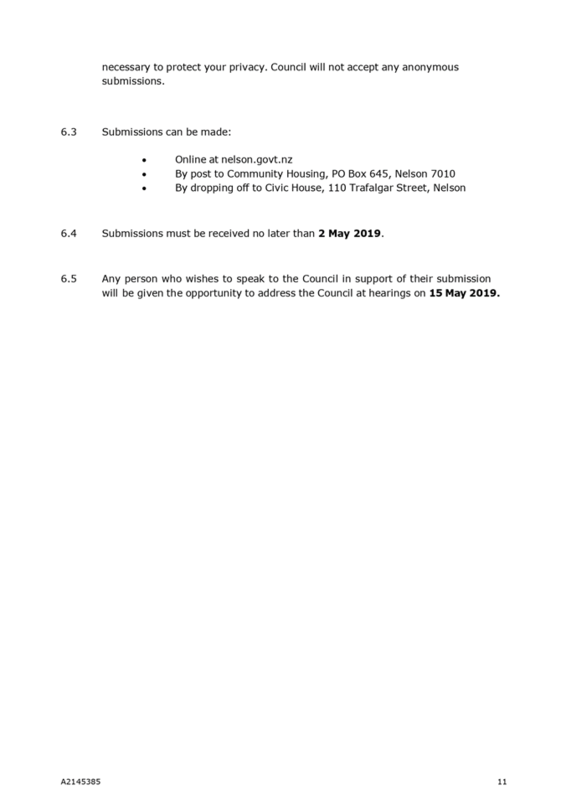 · Any changes to the community housing information would need to be reviewed by Audit New Zealand and could result in a delay to the start of consultation. · Substantive changes to the Annual Plan information may mean the final Annual Plan could not be adopted by 30 June, as required under the LGA. 7.1 It is recommended that the Consultation Document be adopted. 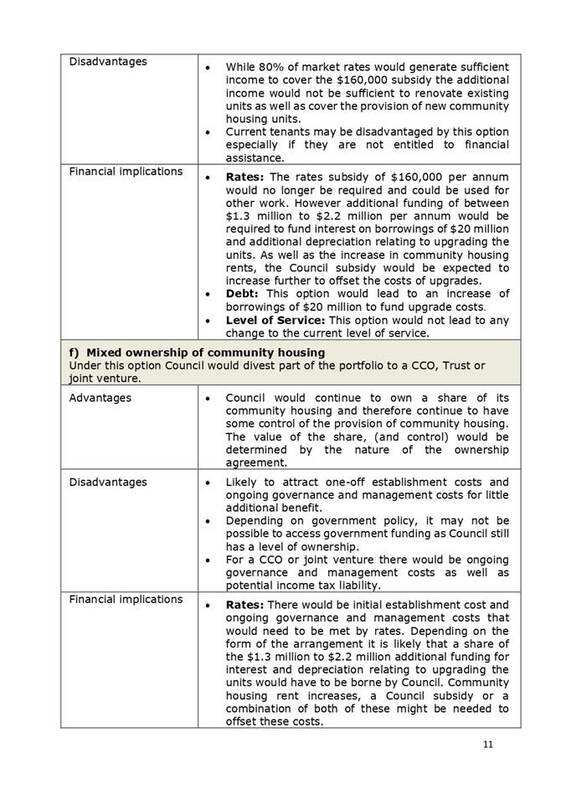 Decisions in this report are necessary to allow Council to consult with the community on whether the current and future needs of the Nelson community for community housing can be more efficiently and effectively met by divesting the assets to an appropriate provider(s). Adopting the supporting information and the Consultation Document is low risk as undertaking consultation on the proposed changes, and the proposed amendment to the LTP, are in line with the requirements of the LGA. There is a risk that some members of the public might object to the final decisions that Council makes. Ensuring a robust consultation process and explaining the reasons for decisions will help mitigate this risk. 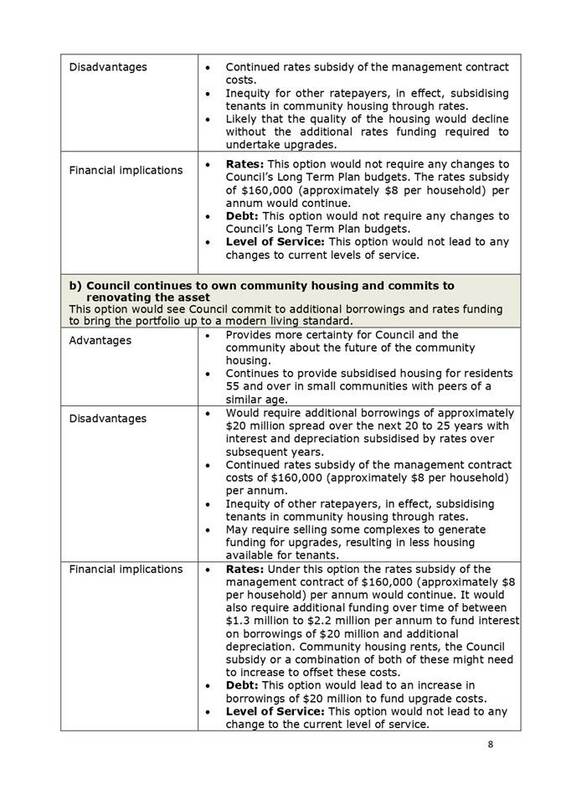 The financial impact of Council’s proposal is reflected in the resulting proposed rates change, debt levels and intended use of proceeds as set out in the Consultation Document. The proposals in the Consultation Document will have varying degrees of significance to different residents and businesses. 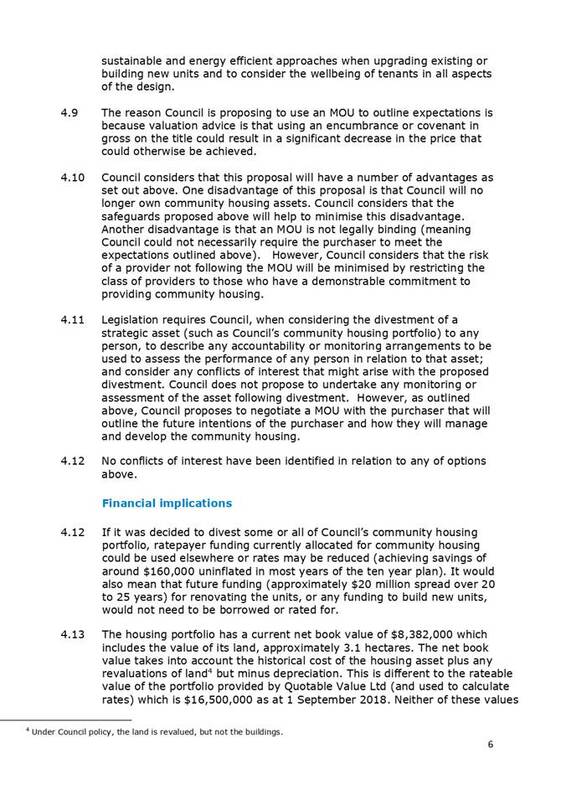 Some of these proposals (such as the proposal to divest Council's community housing portfolio) trigger the need to use the special consultative procedure. Legislation requires Council to carry out a combined consultation using the special consultative procedure, which provides for wide publicity of the Consultation Document, written submissions and hearings. Local iwi have been informed of the proposal to divest Council’s community housing through the Iwi Leaders Forum on 1 March 2019. The Community Services Committee delegated its mandate for decisions relating to the future of Council’s community housing to Council at its meeting on 27 November 2018. The Council has the responsibility to adopt the Consultation Document and to consult with the public on the proposals as set out in the document. 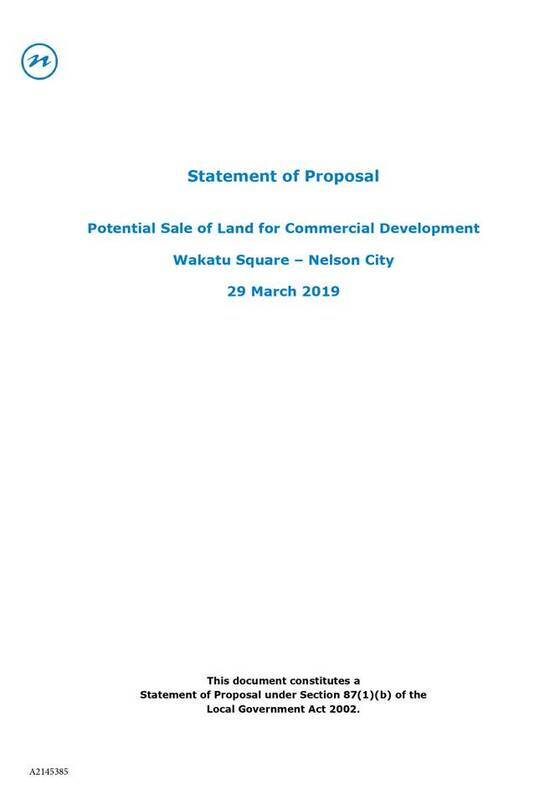 1.1 To adopt the Statement of Proposal – Potential Sale of Land for Commercial Development, to be used for consultation on options for Wakatu Square. 3.1 In the past, the Council has purchased land in stages to form Wakatu Square for the purpose of car parking. 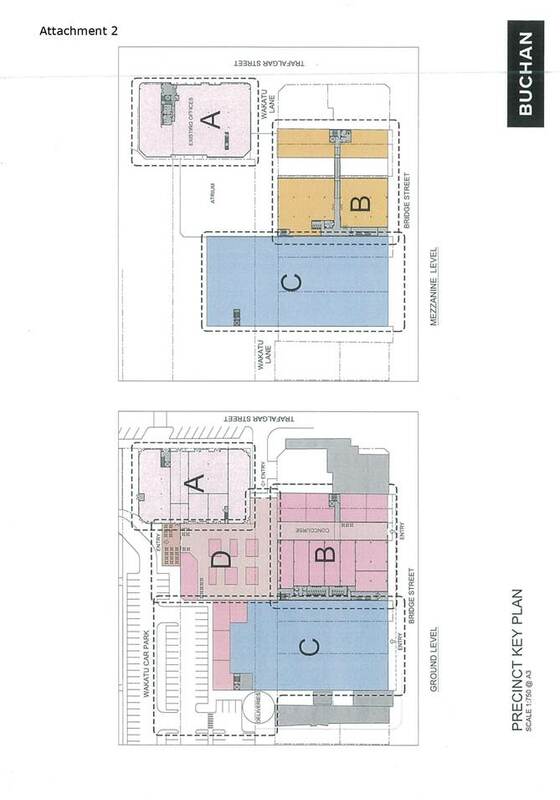 It has also acquired land and buildings at the western/Rutherford Street end of Wakatu Square to expand the carpark and for other strategic purposes, such as a future large scale retail development for the central city. There have been subsequent proposals to redevelop part of Wakatu Square that have not progressed. 3.2 In the later months of 2018, Council was presented with a development proposal from Cephas Property (Nelson) Limited and as a consequence of this interest, Council is considering whether to dispose of part of Wakatu Square. 3.3 At its meeting on 29 November 2018, the Governance Committee resolved to refer to Council all its powers relating to matters referred to in Report R9742. 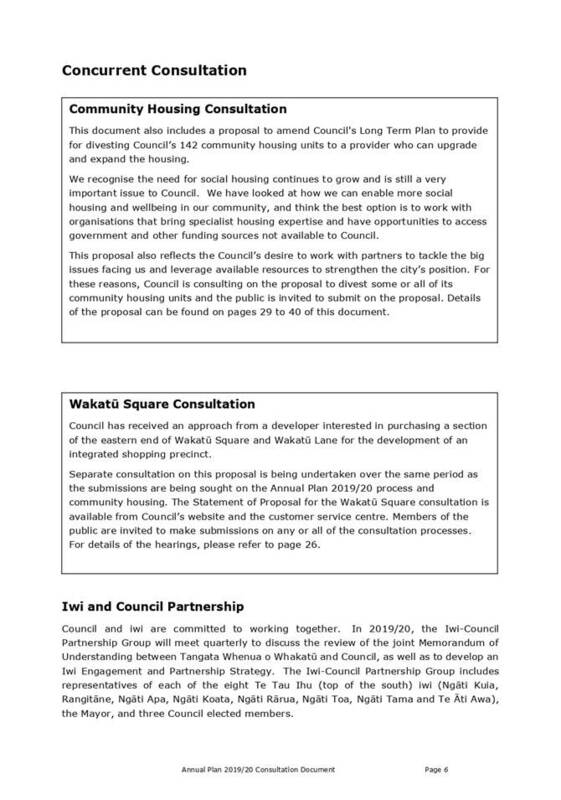 At its meeting on 13 December 2018, Council approved the development of consultation material to support community consultation on the sale of Council land at Wakatu Square. 3.4 A statement of proposal has been prepared to seek public submissions as part of a special consultative procedure on the potential sale of land and detail the process for consultation. 4.1 The proposal for development of part of Wakatu Square provides an opportunity to realise a redevelopment of Wakatu Square in a planned and timely manner. To achieve this, a portion of Wakatu Square and Wakatu Lane is proposed to be sold and public amenity, such as car parks and bus services amongst others, will be affected. 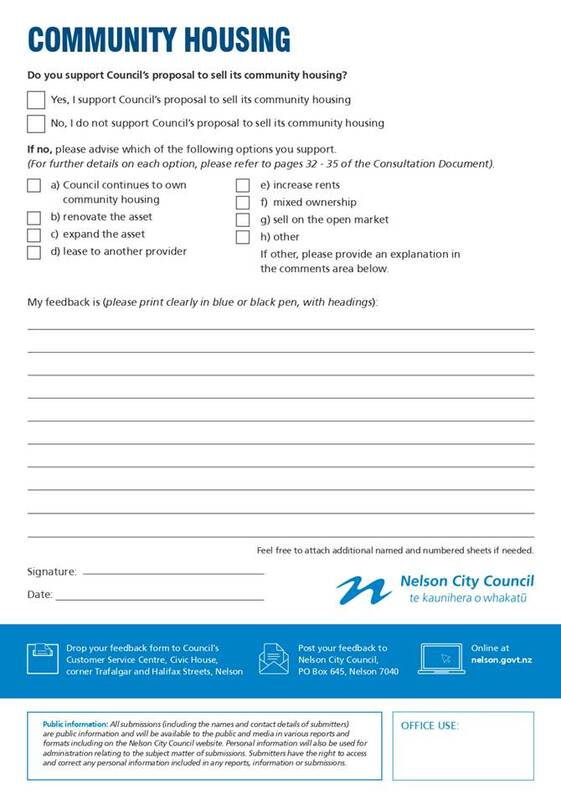 4.2 Due to the high significance of the proposed development for Nelson, officers consider it is appropriate to carry out consultation using the special consultative procedure. 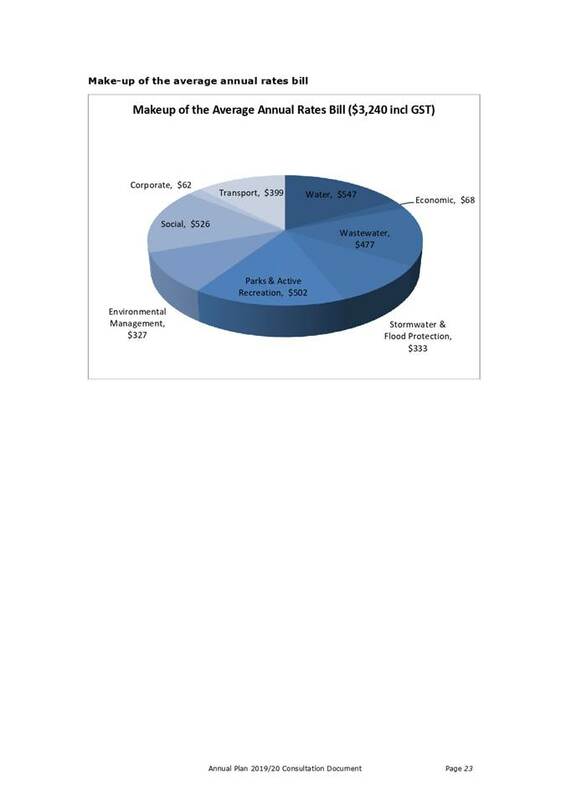 The areas of expected public interest relate to the provision of car parking and bus services, road stopping, utilities and services, hazards, urban design and sale price. 4.3 The current level of public car parks and bus services can continue to be accommodated in Wakatu Square with the demolition of the Council owned building at 81 Achilles Avenue (ex-Hunting and Fishing Building) and redesign of the overall car park layout. The actual number of car parks provided in the subsequent redesign will be determined after consultation, but at a minimum the existing public car park numbers will be maintained. 4.4 Cephas has expressed interest in an increase in car parks, which could be met by adding a car park building in Wakatu Square. However, very preliminary cost estimates obtained by officers indicate that this would be prohibitively expensive at this time. 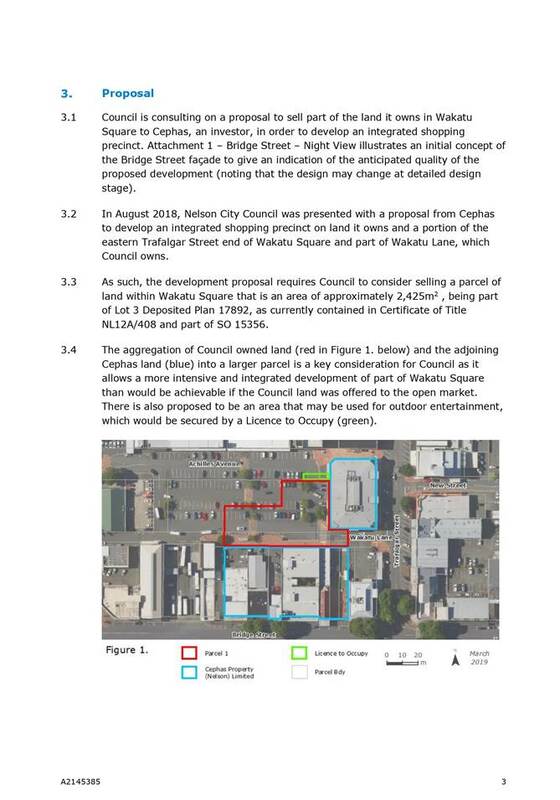 4.5 Further, it is noted that the requirement for car parking and buses for the wider Nelson City may be reviewed in the near future and so flexibility of the solution in Wakatu Square is required. A recommendation on the number of car parks that will be provided in Wakatu Square will be made after the consultation. 4.6 The process of road stopping is covered in section 342 and Schedule 10 of the Local Government Act 1974, with a notification period allowing for submissions from the public. A provision in this Schedule gives Council the opportunity to have a hearing to consider any objections. If Council accepts the objections, then the road stopping process ceases. If Council does not accept the objections, then the matter is referred to the Environment Court for determination. If no objections are received, Council can proceed to stop the road. 4.7 If the Council decides to stop the road in order to dispose of part of Wakatu Lane, then the Council has effectively also decided to not accept any objections and so the matter could be directly referred to the Environment Court for its decision without a Council hearing, if objections are received. That is, when Council deliberates on the decision to sell land in Wakatu Square, part of the decision to sell should include the decision to directly refer any objections to the Environment Court. 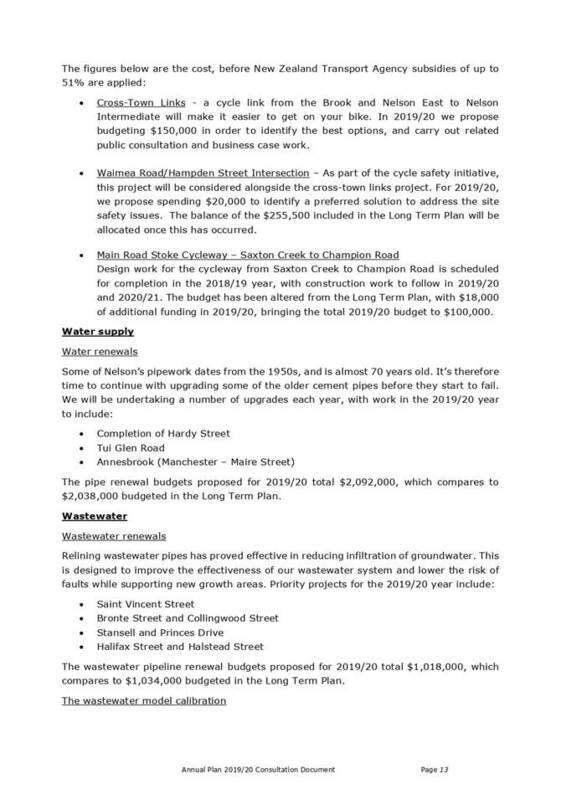 4.8 A review of Council utilities in the existing carpark area and Wakatu Lane suggests that only stormwater reticulation and overland flood flows control would be affected by the construction of a building on the land proposed to be acquired. 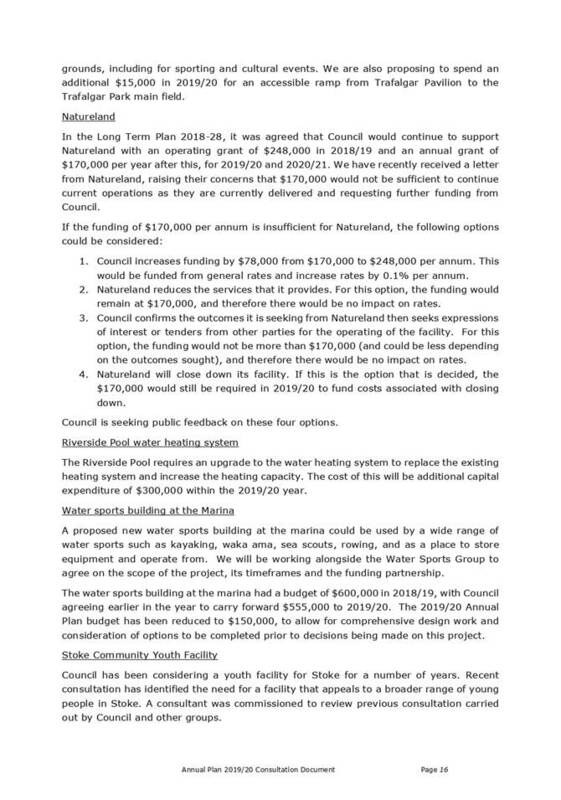 4.9 This proposal provides Council with the opportunity to re-designate some or all of the existing services as private or common private drains if they will no longer serve a public purpose, although the water supply pipe and wastewater drain will need some further investigation. 4.10 The stormwater reticulation is not as straightforward, as the property on the corner of Trafalgar and Bridge Street occupied by Westpac Bank is under separate ownership and its carpark area discharges stormwater to the Wakatu Lane reticulation. 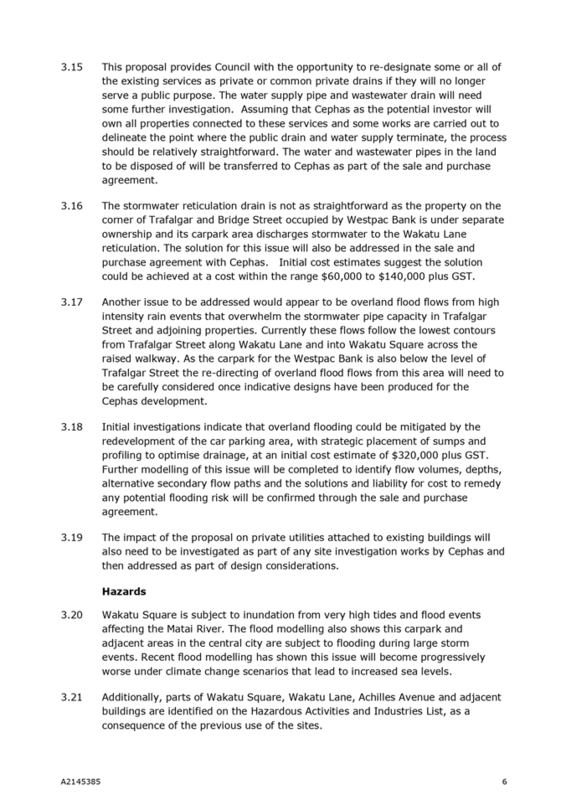 Options to respond to this would be either re-directing the stormwater pipes to Trafalgar Street if possible or establishing the existing drain as a common private drain across the portion of Wakatu Lane that has been stopped. The solution for this issue would be addressed in the sale and purchase agreement with Cephas. 4.11 Another issue to be addressed would appear to be overland flood flows from high intensity rain events that overwhelm the stormwater pipe capacity in Trafalgar Street and adjoining properties. Initial investigations indicate that overland flooding could be mitigated by the redevelopment of the car parking area, with strategic placement of sumps and profiling to optimise drainage. Further modelling of this issue will be completed to identify flow volumes, depths, alternative secondary flow paths. The solutions and liability for cost to remedy any potential flooding risk will be confirmed through the sale and purchase agreement. 4.12 The impact of the proposal on private utilities attached to existing buildings will also need to be investigated as part of any site investigation works by Cephas and then addressed as part of design considerations. 4.13 Wakatu Square is subject to inundation from very high tides and flood events affecting the Matai River. 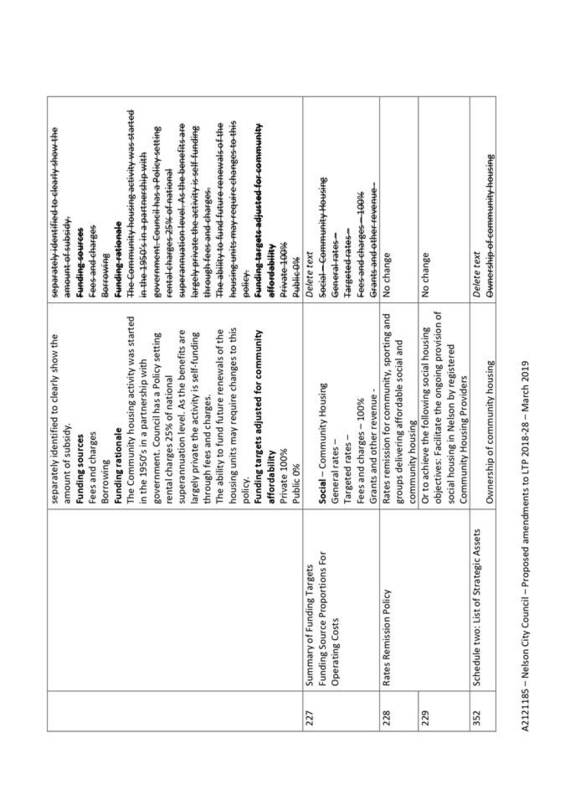 Further, parts of the Wakatu Carpark, Wakatu Lane, Achilles Avenue and adjacent buildings are identified on the Hazardous Activities and Industries List, as a consequence of the previous use of the sites. 4.14 The impact of these hazards will need to be investigated by any purchaser and will be regulated by the Building Code and Resource Management Act. The mitigation of these hazards may be addressed as part of the sale and purchase agreement. 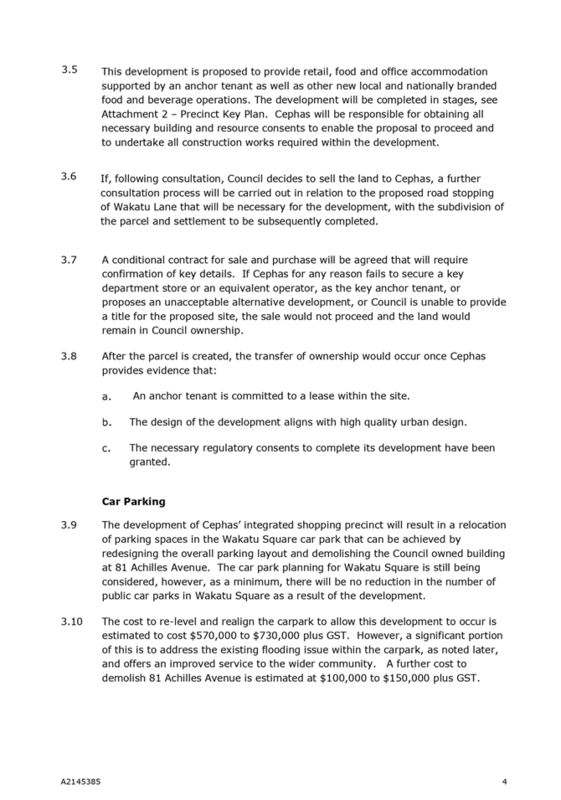 4.15 Council will work with Cephas to ensure that any development that occurs on land Council sells is of a high quality urban design, with a proposed provision within the sale and purchase agreement requiring a review of the initial design development. 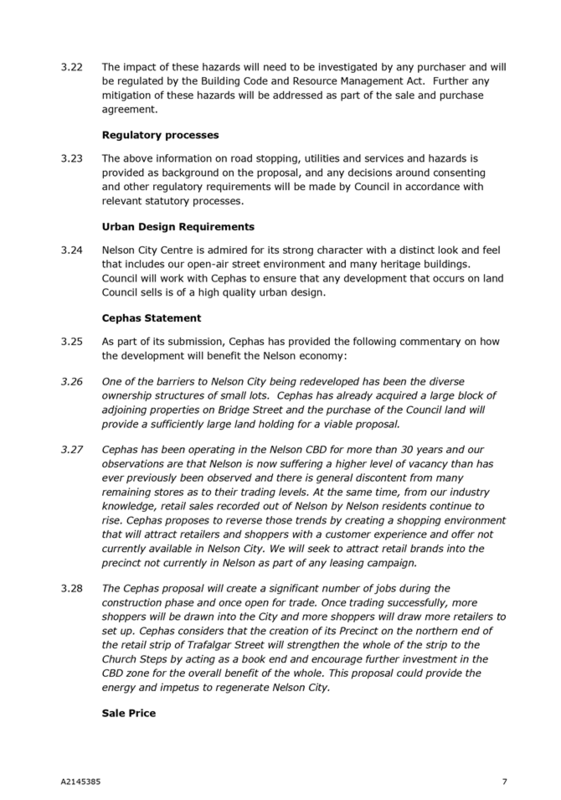 4.16 A successful Cephas proposal has the ability to signal to the wider development community that Council welcomes and enables high quality developments into the City Centre that supports our vision and positively contributes through intensification, diverse offer and mixed-use. 4.17 The price of the parcel of land proposed to be disposed to Cephas has yet to be agreed although preliminary value discussions have occurred as the parties have explored what key value issues should be considered to determine the price. 4.18 To provide context for the public an indicative price range of $600/m2 to $800/m2 has been included in the Statement of Proposal. 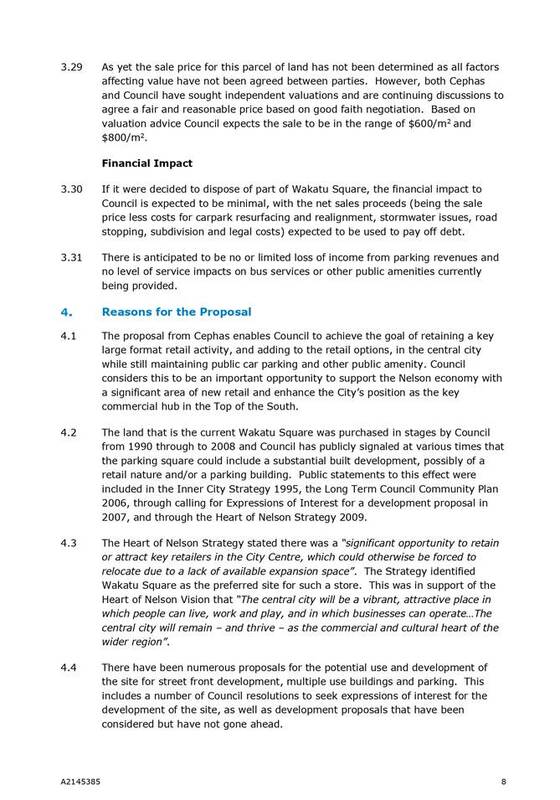 4.19 Research completed by Council officers and discussions with Wakatu Incorporated have not revealed any current or past claim by iwi to any part of Wakatu Square. 4.20.4 There has been significant change in the character of the land (demolition of buildings, amalgamation of titles and creation of a carpark). 4.21 As an initial step in the disposal of land it advisable to consider if it is required for another public work. Officers are unaware of any other public work that may require this land. 5.1 An update on the proposal was given at the Iwi Leaders Forum workshop on 1 March 2019. Additionally, immediately adjoining owners have been contacted and the indicative proposal has been outlined for their initial review and feedback. Surrounding land owners have also been advised of the potential consultation on the proposal to ensure that they are aware of it. 5.3 As part of the deliberations/decision on any sale of land, the impacts and timings of the next steps will considered. 5.4 Section 83 of the Local Government Act 2002 requires Council to consider whether a summary of the Statement of Proposal is necessary to enable public understanding of the proposal. 5.5 Officers recommend that a summary of information not be prepared. 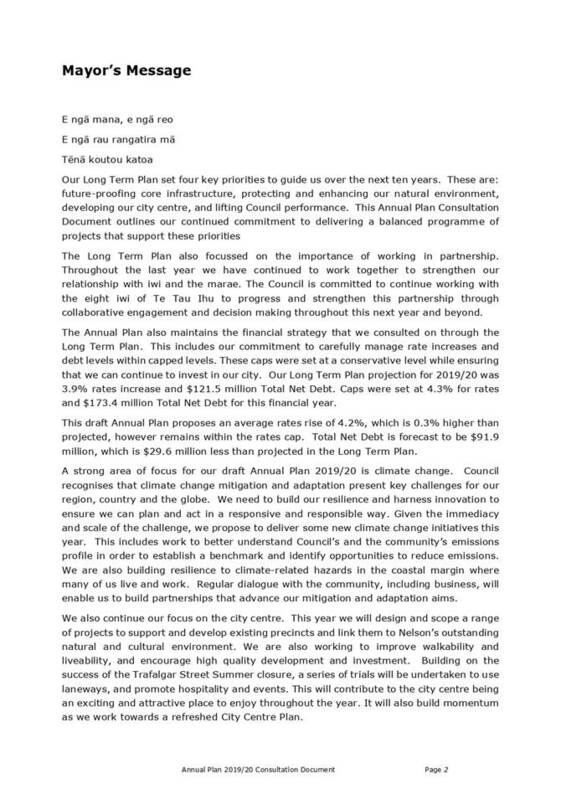 The full Statement of Proposal is only 10 pages long and a summary of information would probably be half this length. Furthermore, the consultation process includes an article on the proposal in Our Nelson, which is distributed throughout Nelson. 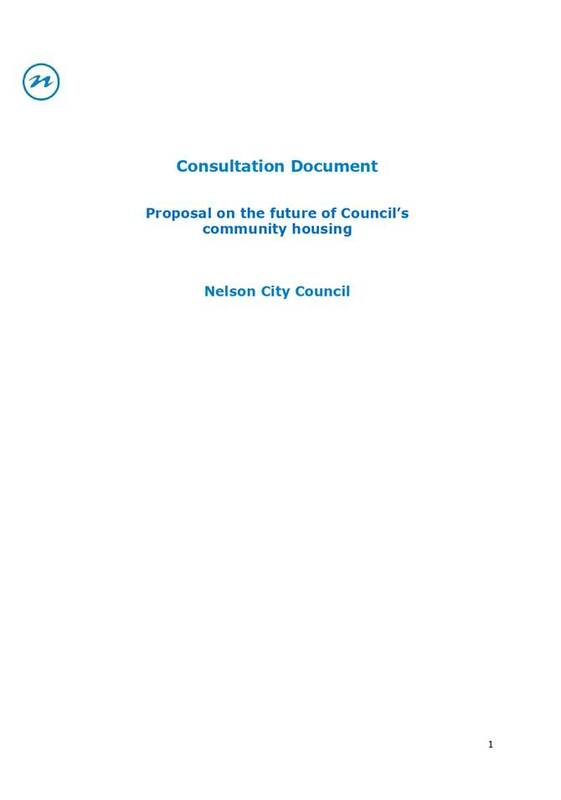 The Our Nelson article, supported by the additional proposed consultation processes set out below, are considered the best means of providing information to the public on the major matters in the Statement of Proposal. · A special edition of Our Nelson to be delivered to households. 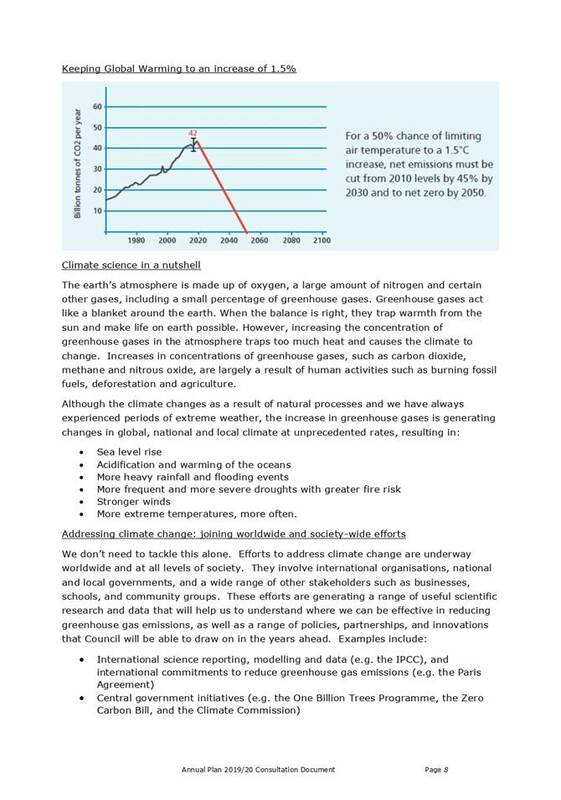 This is the main means of publicising the Statement of Proposal. 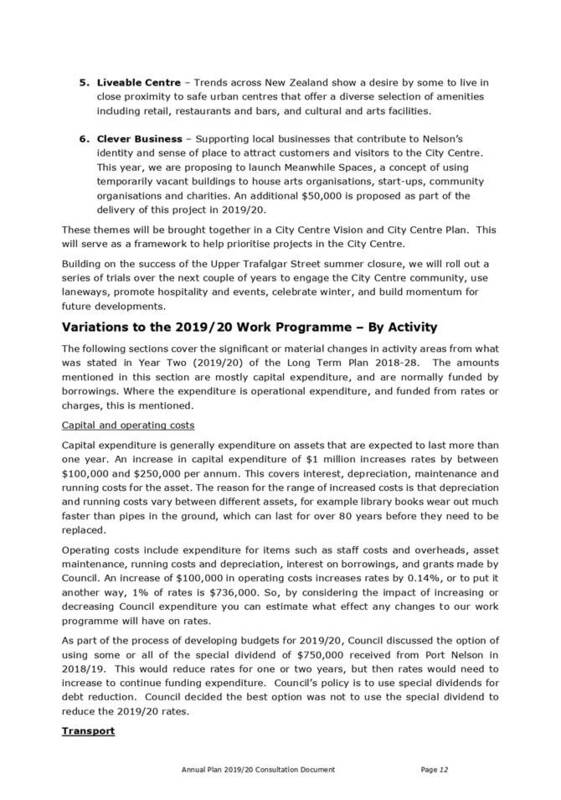 · Copies of the Statement of Proposal will be available from the Customer Services Centre and Council libraries and also available on the Council website. 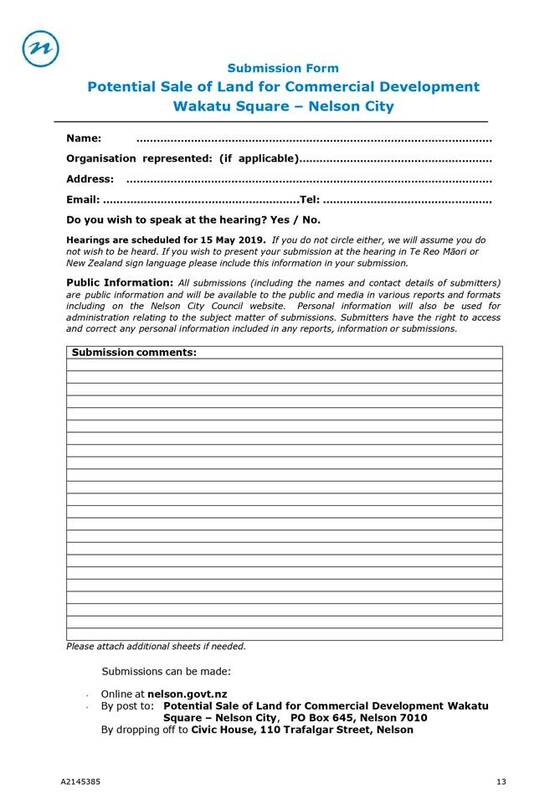 · Copies of the Statement of Proposal are available for councillors to take to any community meetings that they attend during the consultation period. · Social media and media releases also be used to publicise the consultation. · Meets requirements of the Local Government Act. · Community feedback would be sought, and as a result of this feedback changes can be made before a final decision. 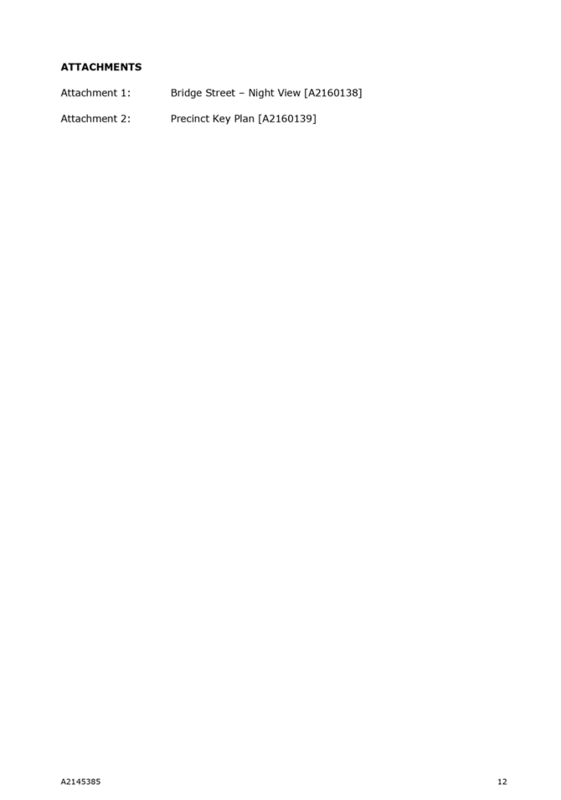 · Consultation diverts Council resources away from other activities. 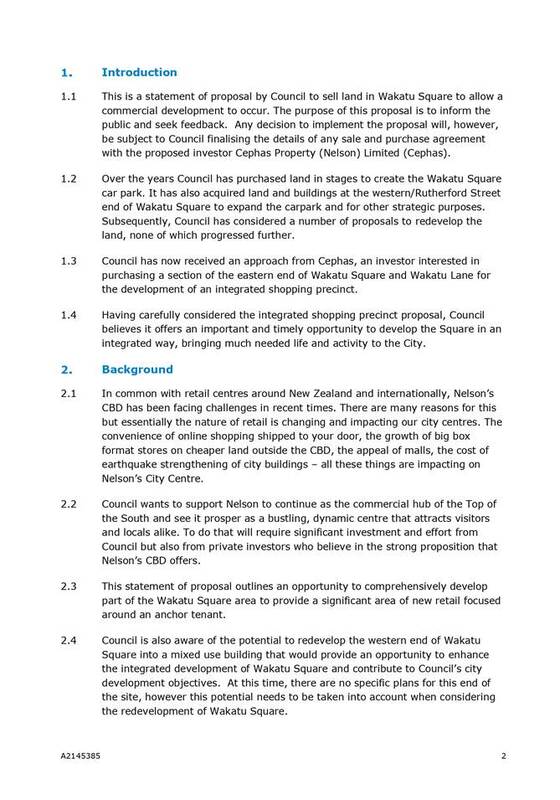 · Council retains ownership of all of its current landholdings in Wakatu Square. This preserves the availability of this land for a range of potential future activities. 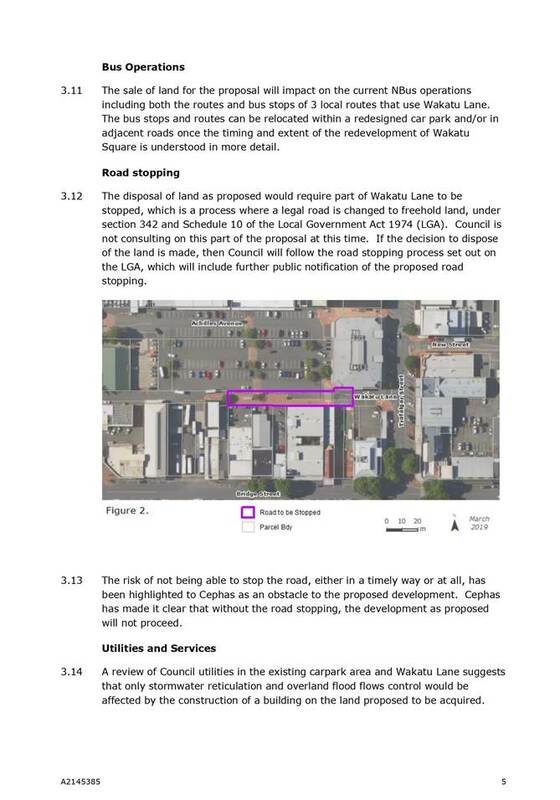 · No disruption to current vehicle use of Wakatu Square. · Council will not obtain public views on the proposal. 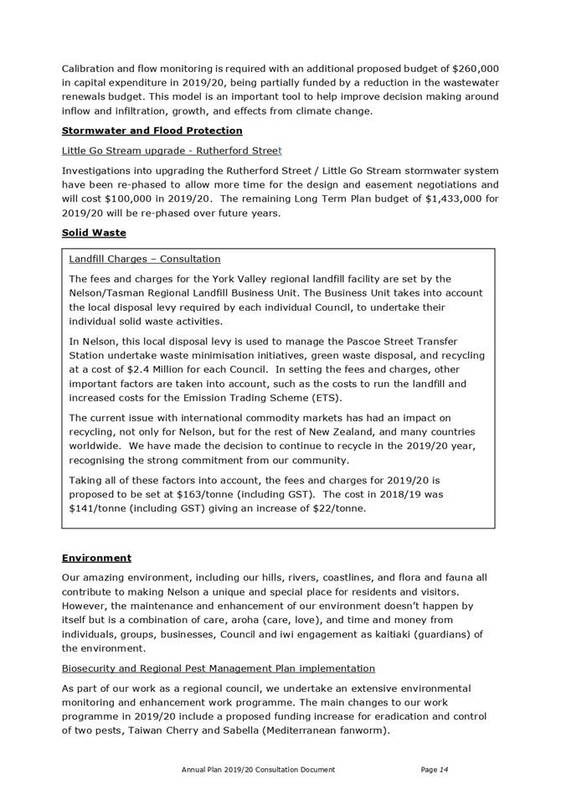 · Council will forego receipt of the purchase monies. 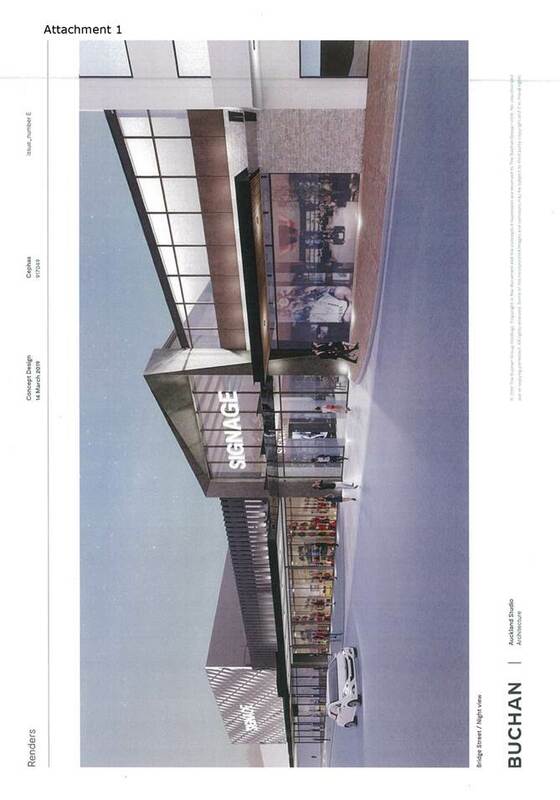 · Council may be perceived to be unsupportive of city redevelopment. · Some retailers may leave the City Centre thereby affecting the retail viability of the City Centre and negating the substantial investment of public money that has occurred to enhance the viability of the City Centre. Council is requested to adopt the Statement of Proposal and initiate the consultation process. 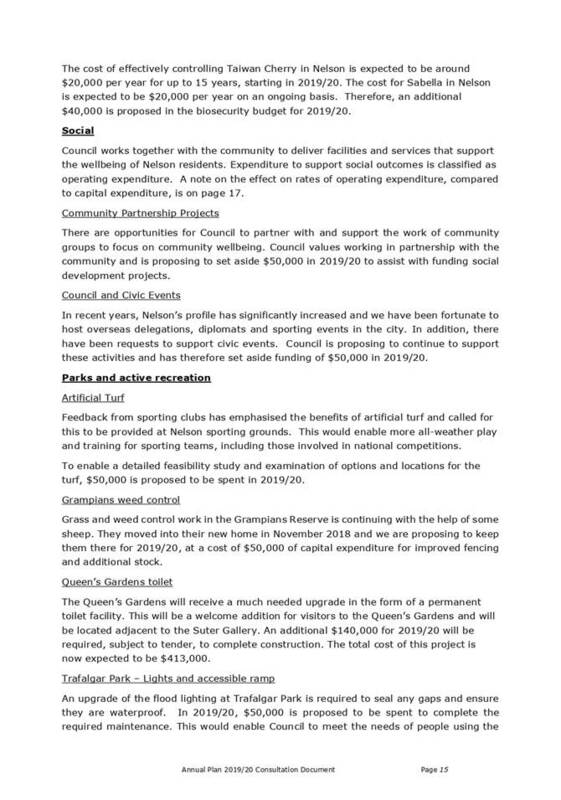 Consideration of these development proposals allows Council to pursue opportunities that have the potential to provide good quality local infrastructure and services and bring economic benefits to Nelson. Further, City Centre development was one of the priorities of the 2018 Long Term Plan. There is low risk associated with the consultation, although it does divert staff resources from other scheduled projects and work streams. There is a risk that the investors decide not to proceed with the development, which would mean staff have spent unnecessary time on consultation. An outcome of the non-development of the urban shopping precinct is the potential loss of large format retail from the City Centre. There is financial risk to Council to fund any shortfall of infrastructure and amenity development costs, which may not be covered from sales proceeds or investor contributions. A reputational risk may arise from public dissatisfaction through a lack of opportunity to bid for the purchase of any disposed land. Seeking further input from the community enables Council to understand community views and fulfils Council’s obligations under the Local Government Act 2002. The decision to carry out the consultation has a relatively limited financial impact that will be carried out within existing budgets. 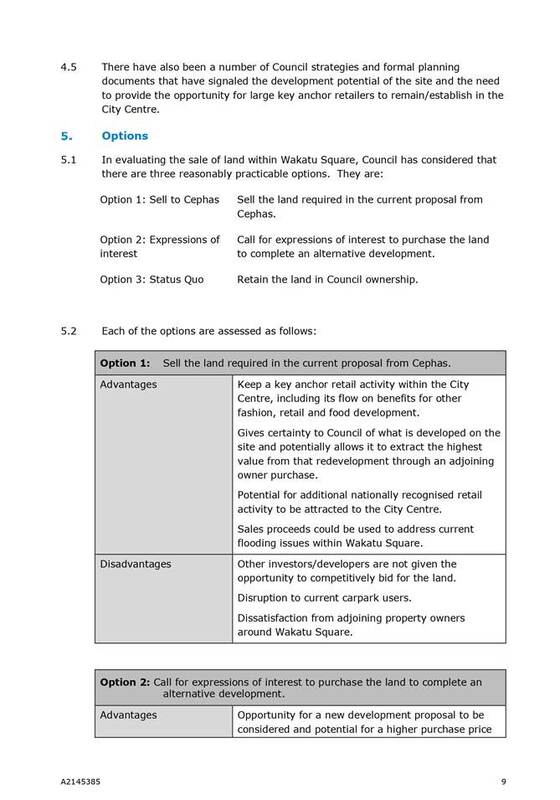 Any decision relating to sale, or otherwise, of the land will have a financial impact and this impact will be considered in the deliberations report. This matter is of high significance, given the expected level of public interest, and therefore a special consultative process is being undertaken. Iwi have been updated on the project at the Iwi Leaders Forum and will continue to be informed of the progress of the consultation and decision on disposal. Council has had the power to decide on this matter referred to it by the Governance Committee on 29 November 2018. 1.1 To seek approval for the draft Nelson Tasman Future Development Strategy (NTFDS) to be provided to the public, statutory stakeholders and iwi partners for feedback under the Local Government Act 2002 (LGA). 1.2 A similar report with the same recommendation is being presented to Tasman District Council on 28 March 2019 as alignment in decision making is required to support the consultation, consideration and adoption process across both Councils. 1.3 All attachments will be tabled at the meeting. 3.1 The Government introduced The National Policy Statement on Urban Development Capacity (NPS-UDC) in 2016 with the aim of ensuring that Councils plan for, and enable the supply of sufficient housing and business land needed to meet demand. 3.2 The NPS–UDC applies to all local authorities, but particularly those that have part, or all, of either a medium or high growth urban area within their district or region. 3.3 The Nelson and Tasman Main Urban Area is defined in the NPS-UDC and includes both Richmond and Nelson. The area is classified as a medium growth urban area, falling just below the ten percent threshold (9.95%) that defines a high growth urban area. 3.4 The NPS-UDC encourages (but does not require) that local authorities that have part or all of a medium growth urban area within their district or region to prepare a future development strategy (FDS). Approves the preparation of a Nelson Tasman Future Development Strategy - Consultation Documents for the Nelson and Tasman Regions in partnership with Tasman District Council. 3.6 The purpose of a FDS is to demonstrate there will be sufficient, feasible development capacity (residential and business) in the medium and long terms and that minimum targets will be met. 3.7 National guidance states that a FDS shall identify the broad location, timing and sequencing of future development capacity. 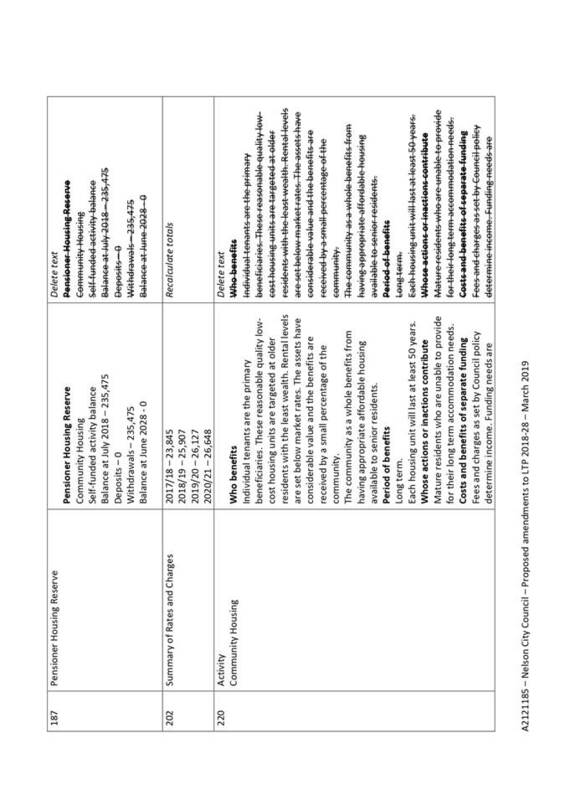 The FDS is a high level strategy document that is to be used to inform resource management plans, infrastructure strategies and long term plans where further testing and evaluation of growth options through cost benefit analysis, business cases and Resource management Act 1991 (RMA) and LGA public consultation processes. 3.8 The preparation of a FDS for Nelson and Tasman presents an opportunity for both Councils to take a strategic look at where and how growth can be managed over the next 30 years, particular focusing on years 11 to 30. Current Long Term Plans and Resource Management Plans provide housing and business capacity for years 1 to 10. The FDS provides the opportunity for both Councils to work together to confirm a vision to sequence growth including infrastructure investment, servicing and release of land in a coordinated way. 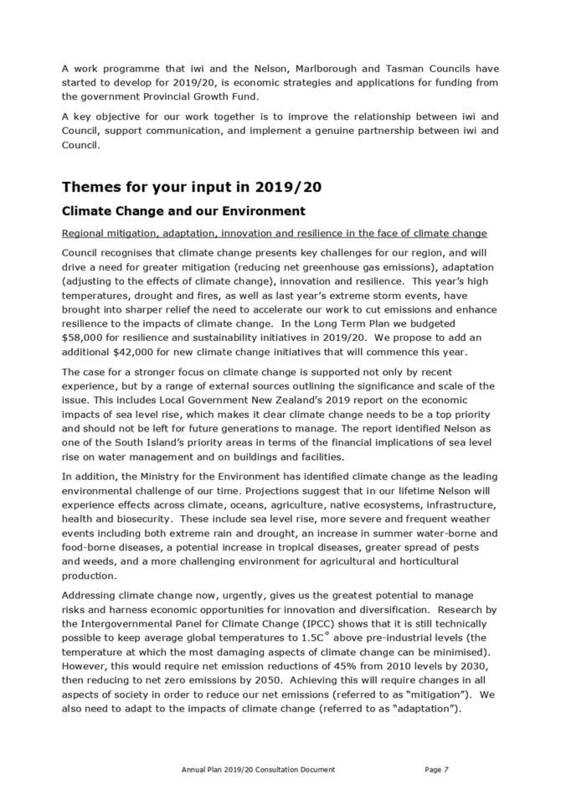 3.9.4 Be informed by the growth planning of other organisations, including but not limited to iwi, the Nelson Marlborough District Health Board, Port Nelson Ltd, the Department of Conservation, and the Ministry of Education. 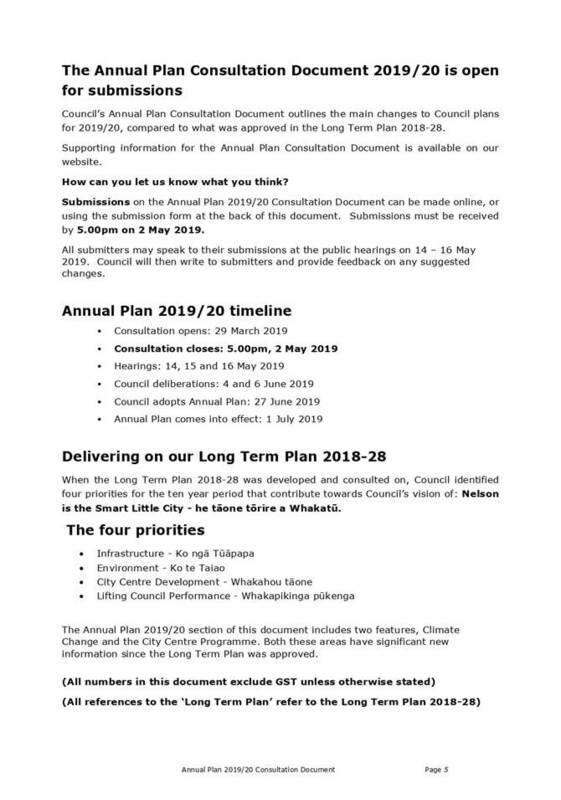 3.9.12 Be finalised prior to July 2019 in order to be available to the community to inform their feedback on the 2021-31 Long Term Plan (LTP). 4.1 Officers completed and reported to their respective Councils on 13 December 2018 their Residential and Business Capacity Assessments required under the NPS UDC. 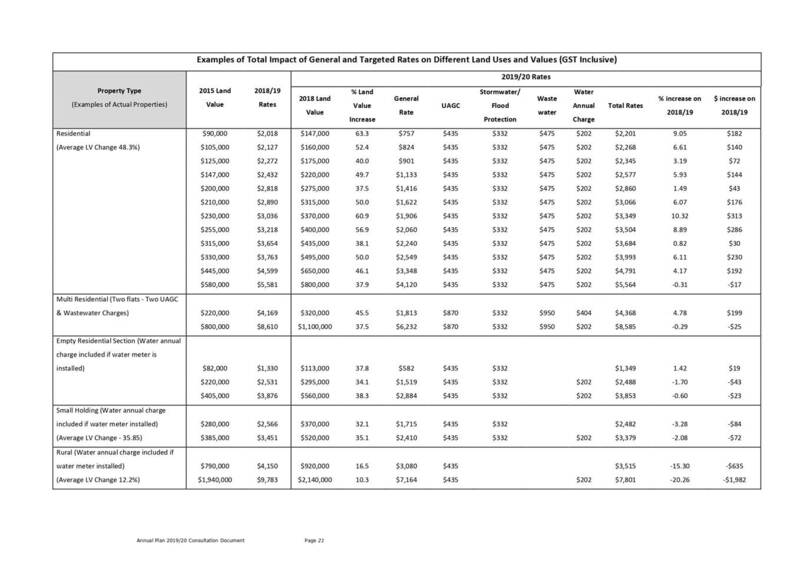 These documents have formed the basis of the demand analysis of the NTFDS. Summary public and stakeholder feedback presented, feedback on criteria and scoping options to be assessed. 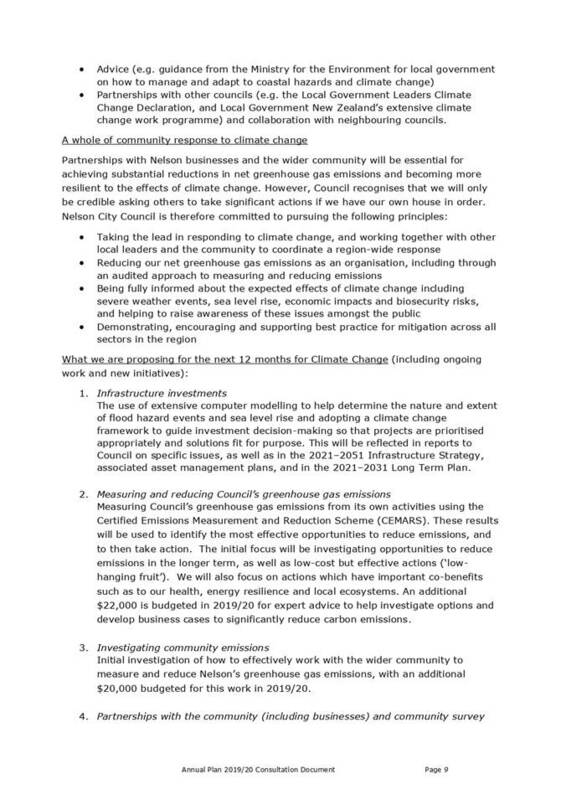 4.3 Prior to the Council receiving this report, a Joint Council workshop was also held on 19 March 2019 to provide both Councils with an opportunity to discuss the draft NTFDS. Officers will provide an update at the meeting on any changes to the NTFDS that have been made in response to issues raised at the workshop. 4.4 The NPS UDC requires that Council undertake a consultation process on their future development strategy that complies with the consultation process requirements from either Part 6 of the Local Government Act or Schedule 1 of the RMA. 4.5 Council is required under section 31 of the RMA to ensure there is sufficed development capacity in respect of housing and business land to meet expected demands. 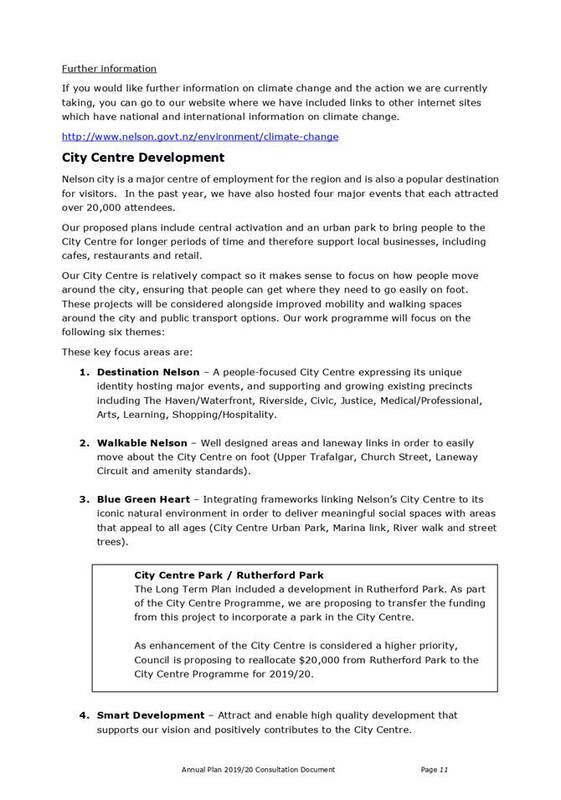 4.6 The future development strategy is a vehicle for Council to have an informed conversation with communities on how to accommodate future growth demands. Officers recommend that the draft strategy be released to the community of Nelson and Tasman regions for feedback, using the process in Part 6 of the Local Government Act 2002. The draft NTFDS is proposed to be released for public feedback from 8 April 2019 to 6 May 2019. All feedback will be presented to a Joint Council workshop where officers will seek direction from Council on changes as a result of feedback received. 4.7 Council decided on 9 August 2018 that the NTFDS would not be adopted as a statutory document under the respective resource management plans and therefore an RMA consultation process is not required. In the future the NTFDS will however provide guidance for both Councils Regional Policy Statements and District Plans on growth and development. 5.1 Council has the option of seeking public feedback on the draft NTFDS as the next step in its development. Provides the public with an informal opportunity to provide feedback and have it considered by the Council. Generally considered good practice to consult those who might be affected by or have a view on Council decisions. While not a special consultative procedure Council has obligations under section 78 of the Local Government Act to seek and consider feedback on policies and standards to be adopted. Provides the opportunity for officers to respond to feedback and make amendments under the direction of both Councils. Providing a draft for feedback, considering that feedback and making appropriate amendments reduces risks that the community does not support the proposed NTFDS, but adds time to the process. May reduce the time taken to adopt the NTFDS. Does not meet the requirements of section 78 of the Local Government Act creating a risk of legal challenge because the views of those who may be affected have not been sought. Does not meet the requirements of the NPS-UDC which requires that Council undertake a consultation process under either Part 6 of the LGA2002 or the RMA1991. The community may not support all or part of the NTFDS which may make it difficult to implement through subsequent processes requiring consultation (i.e. plan changes). The NPS-UDC strongly recommends that medium growth urban areas undertake a Future Development Strategy. Ignoring Government guidance may affect our regions ability to demonstrate prudent planning and eligibility for any national funding or tools to assist to manage growth issues. The Nelson and Tasman regions are unable to provide sufficient feasible development capacity over the next 30 years. The Nelson and Tasman areas are currently under significant growth pressure, including a housing shortage. The FDS is a tool to guide regulatory and financial planning documents seeking to address those issues over the next 30 years. Without that guidance growth areas and infrastructure capacity may not be enabled in a timely or efficient manner. Development occurs in an ad hoc manner creating infrastructure inefficiencies and potentially affecting the cohesiveness of the community. Lack of certainty to public and private investors may affect the perception of Nelson being open to growth, and may increase investment risks that disincentivises development. 6.1 The draft NTFDS is proposed to be released for public feedback from 8 April 2019 to 6 May 2019 under the Local Government Act 2002. Officers will seek direction from a Joint Council Workshop on the feedback received and changes required to the draft before reporting it to Council. The NTFDS provides options for growth and infrastructure provision over the next 30 years to ensure that sufficed capacity is provided to enable statutory compliance, health safety and wellbeing of the Nelson and Tasman community. The NTFDS is consistent with the community outcomes and will assist Council to achieve them, particularly “Our urban and rural environments are people friendly, well planned and sustainably managed” and “Our infrastructure is efficient, cost effective and meets current and future needs”. The recommendation seek to release a draft NTFDS for public feedback. This process reduces risk by ensuring the Council gives consideration to the views and preferences of persons likely to be affected by, or to have an interest in, the matter as required under the Local Government Act 2002. 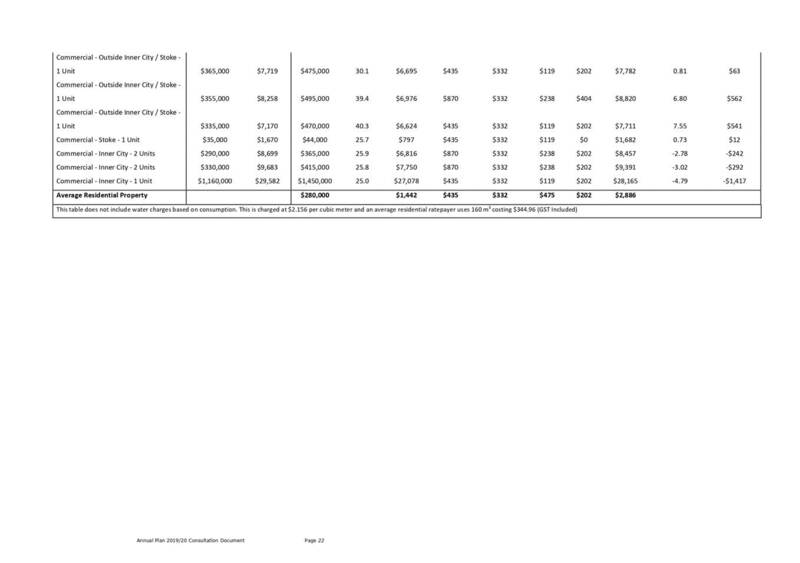 There is no financial impact of release a draft for public feedback, all costs are covered within existing budgets. 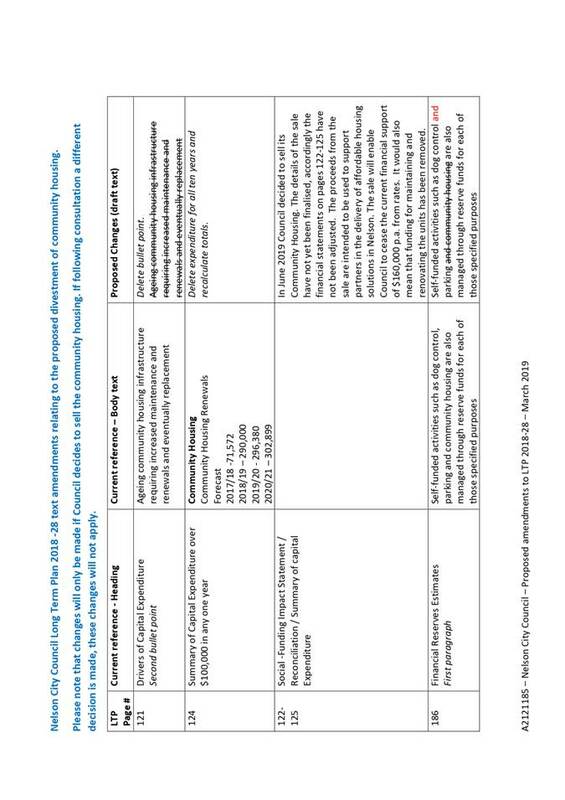 This matter is of low to medium significance because it is a draft high level document that identifies broad options for growth which all have to pass through the RMA plan change and LTP infrastructure funding consultative procedures subsequent to the adoption of this document. Officers consider that releasing the draft NTFDS for public feedback is commensurate with the nature and statutory significance of the document and allows the public to provide their feedback in an informal manner. No engagement with Māori has been undertaken in preparing this report, consultation with Iwi in preparing the draft FDS has been outlined in section 2. 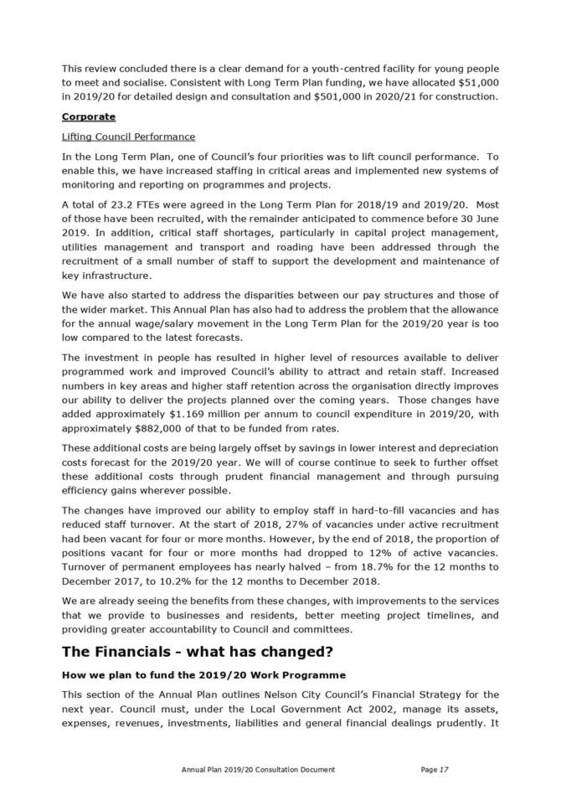 The previous report of 9 August 2018 on the Future Development Strategy went to full Council because it was considered to be across committee matter due to its infrastructure and planning considerations. 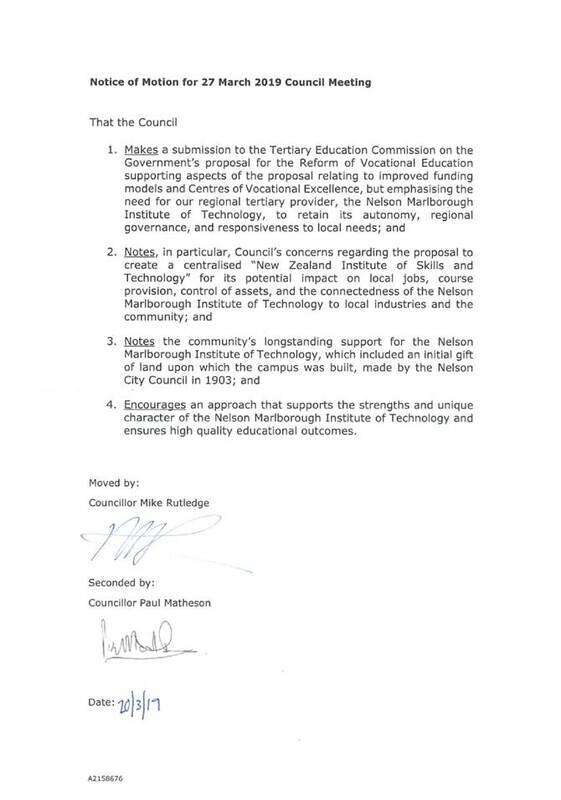 1.1 To consider the notice of motion from Councillor Mike Rutledge requesting a submission be made by Nelson City Council to the Tertiary Education Commission on the Government’s proposal for the Reform of Vocational Education, noting that the consultation period closes on 27 March 2019. 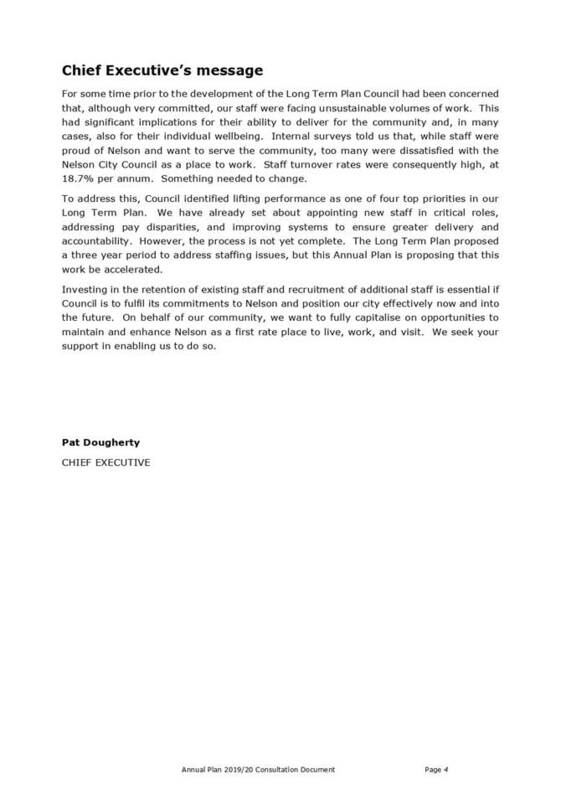 2.3 A copy of the Notice of Motion received by the Chief Executive from Councillor Rutledge is attached.